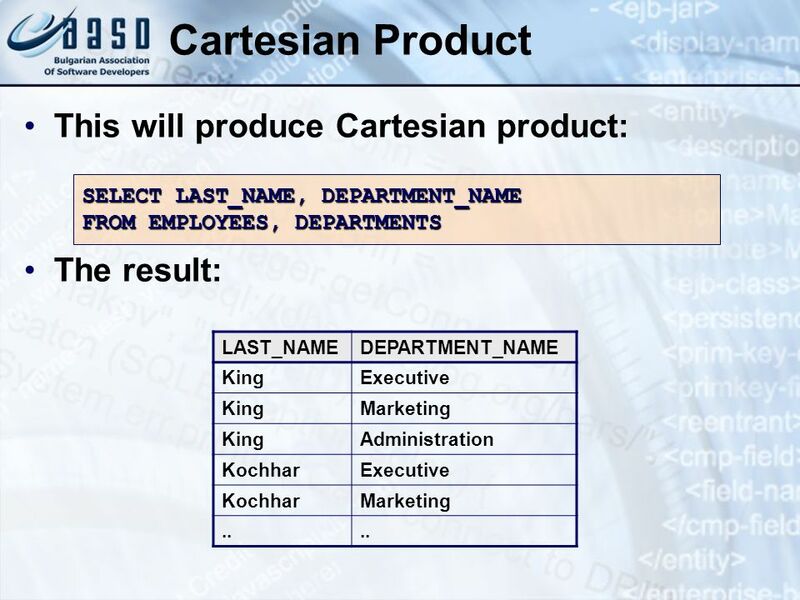 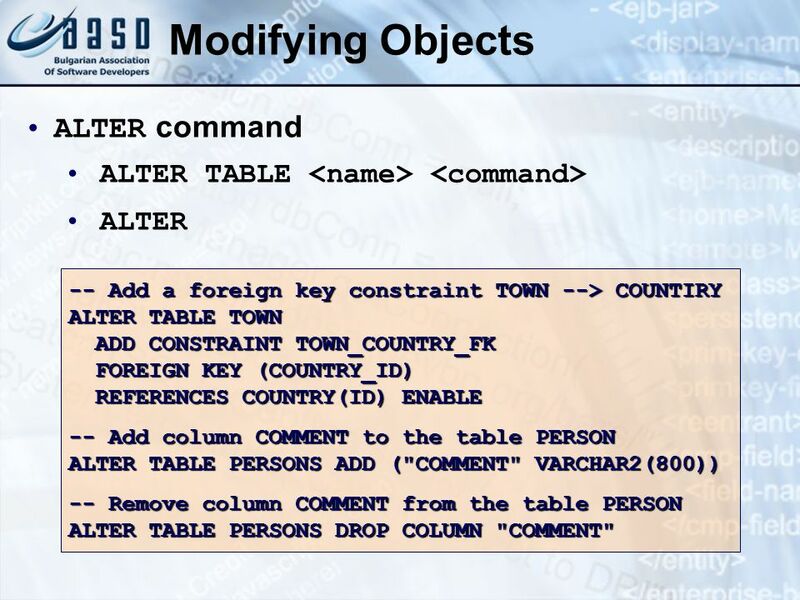 SELECT LAST_NAME, DEPARTMENT_NAME FROM EMPLOYEES, DEPARTMENTS LAST_NAME DEPARTMENT_NAME King Executive Marketing Administration Kochhar ..
ALTER TABLE <name> <command> ALTER -- Add a foreign key constraint TOWN --> COUNTIRY ALTER TABLE TOWN ADD CONSTRAINT TOWN_COUNTRY_FK FOREIGN KEY (COUNTRY_ID) REFERENCES COUNTRY(ID) ENABLE -- Add column COMMENT to the table PERSON ALTER TABLE PERSONS ADD ("COMMENT" VARCHAR2(800)) -- Remove column COMMENT from the table PERSON ALTER TABLE PERSONS DROP COLUMN "COMMENT"
89 Problems (4) Write a SQL query to find to top 5 best paid employees. 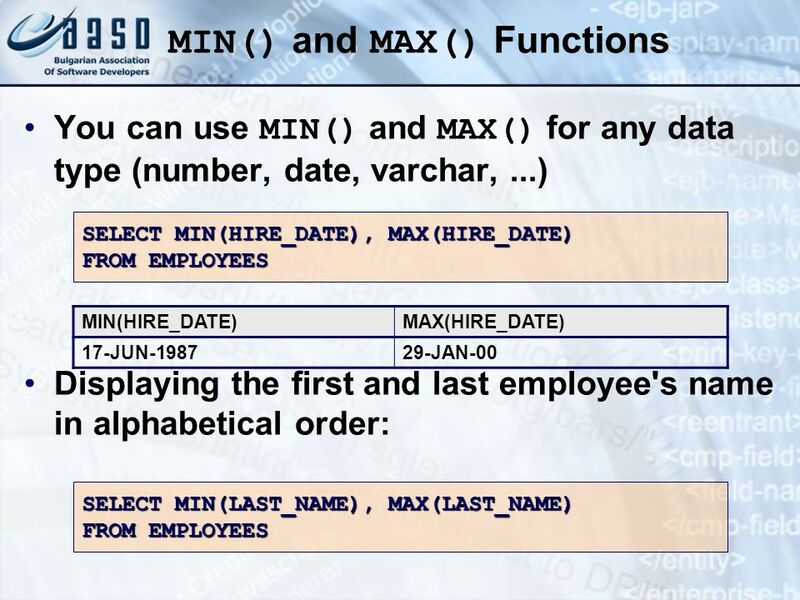 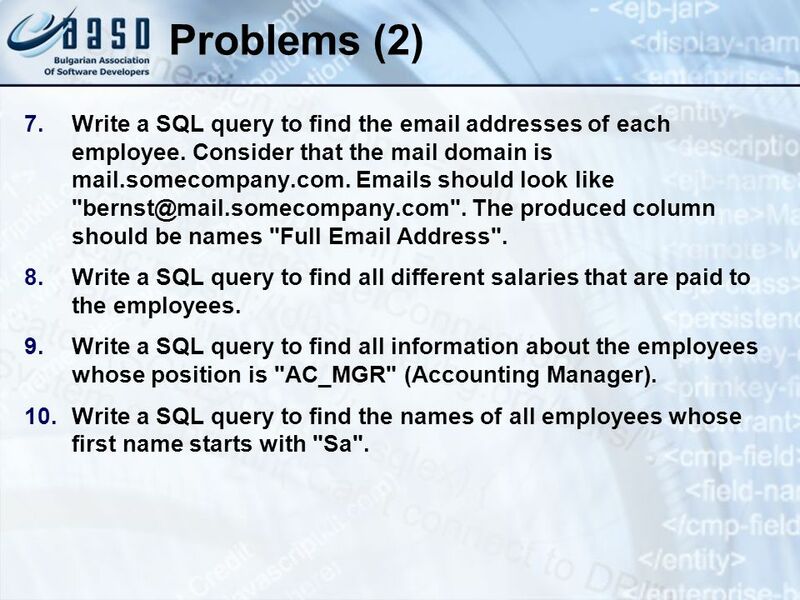 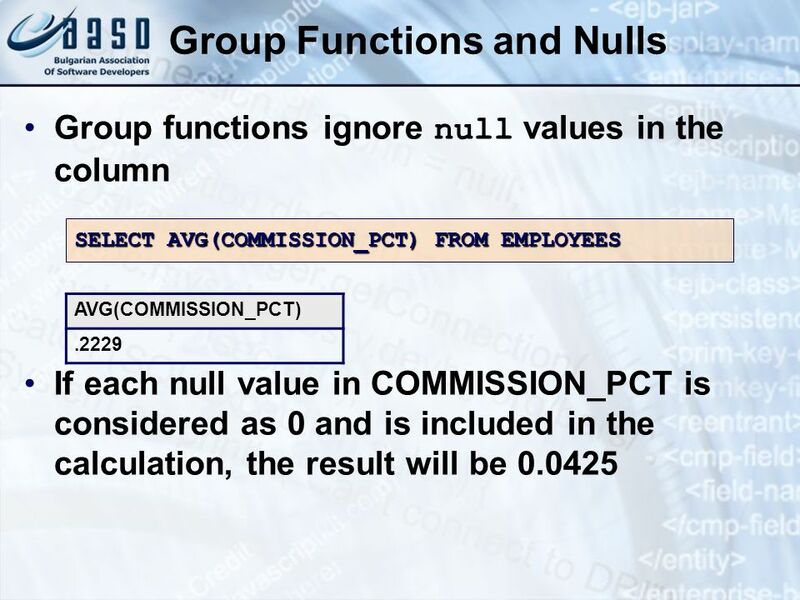 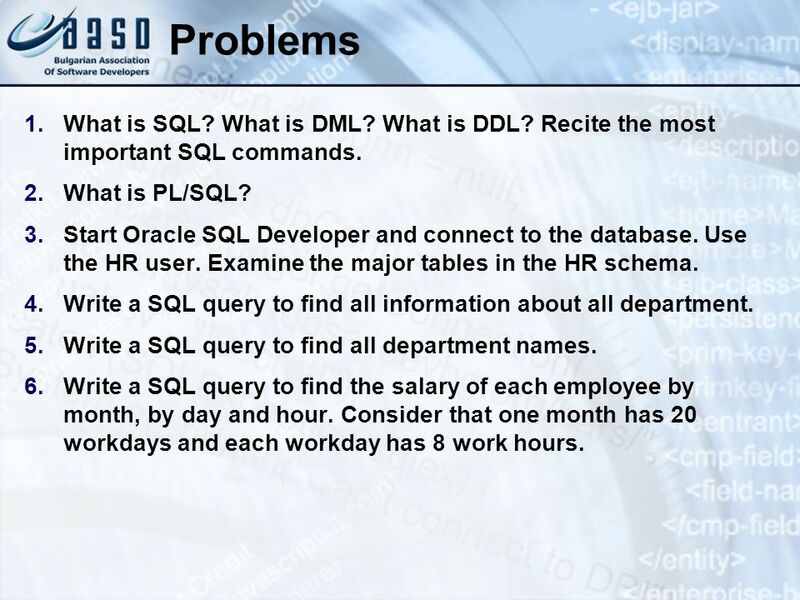 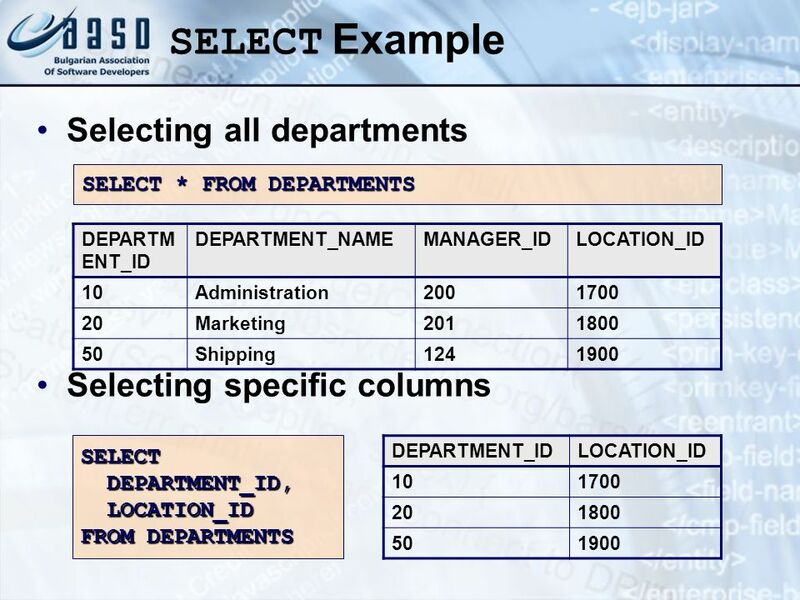 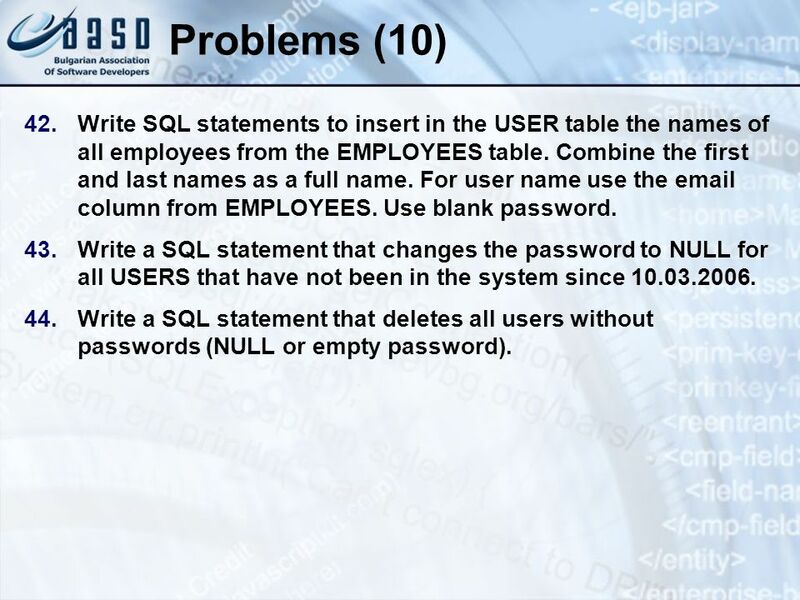 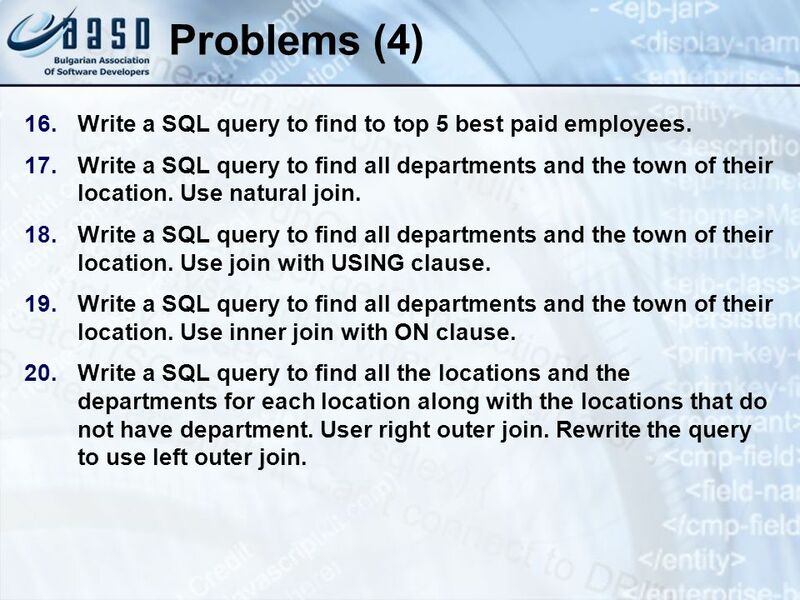 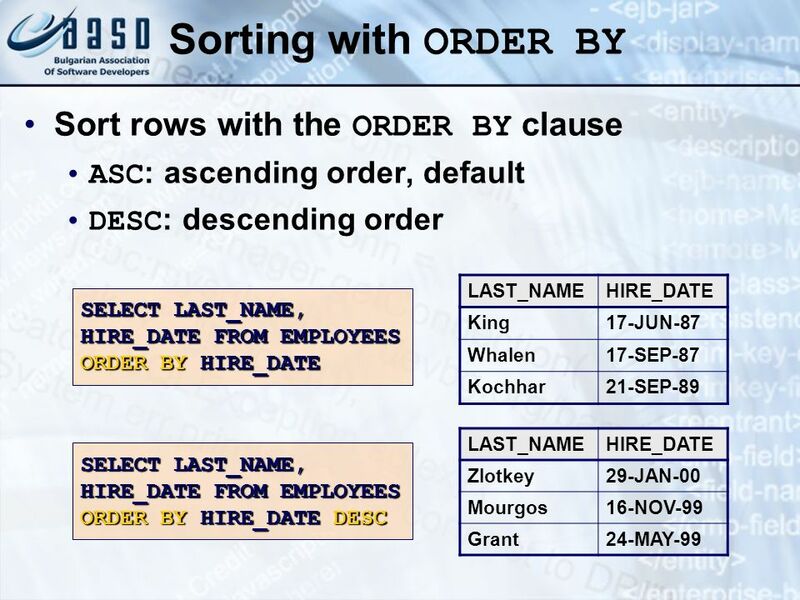 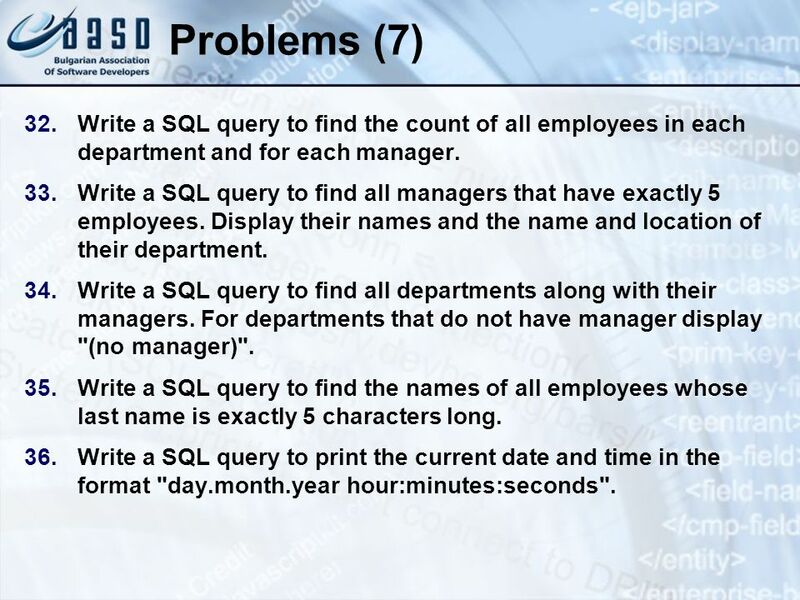 90 Problems (5) Write a SQL query to find the manager of each department. 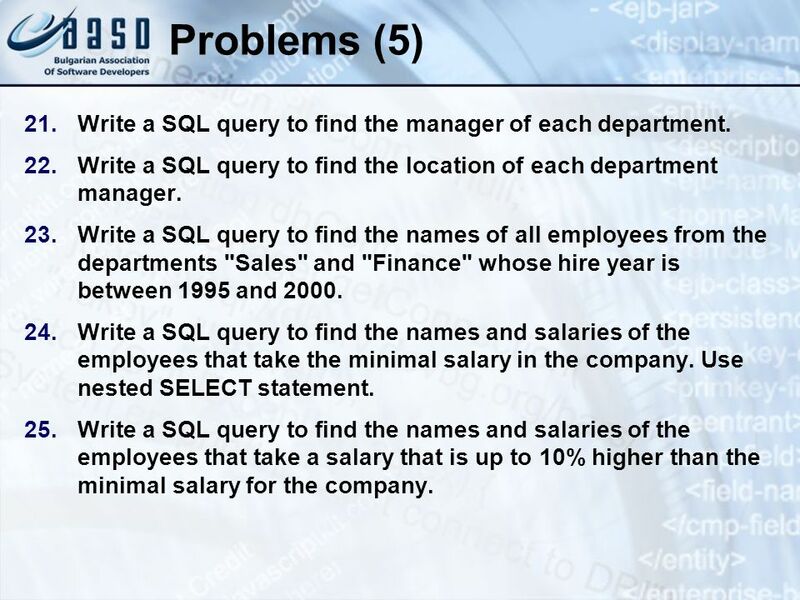 96 Homework Write a SQL query to display the average employee salary by country. 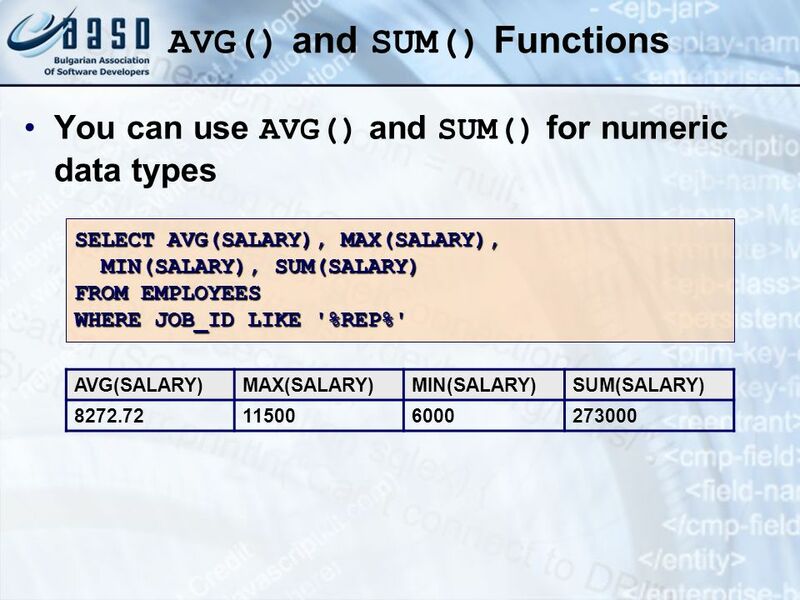 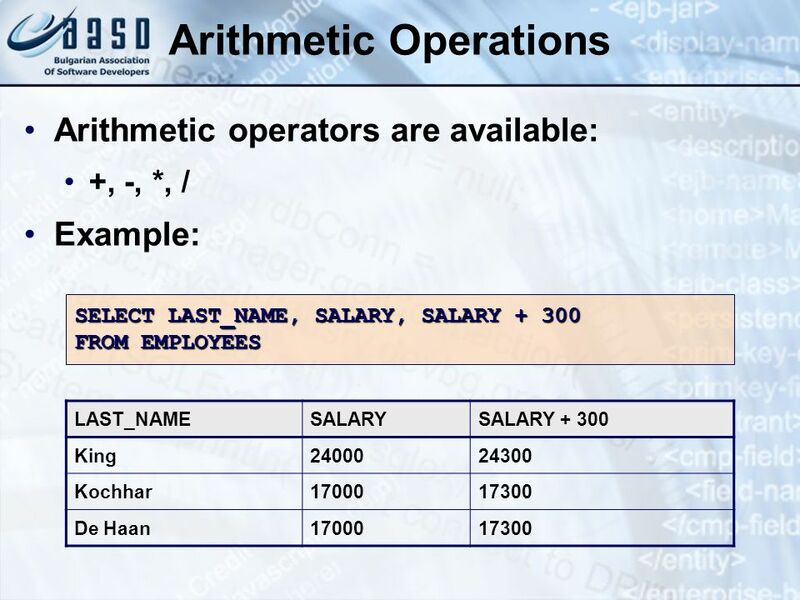 Write a SQL query to display the average employee salary by region. 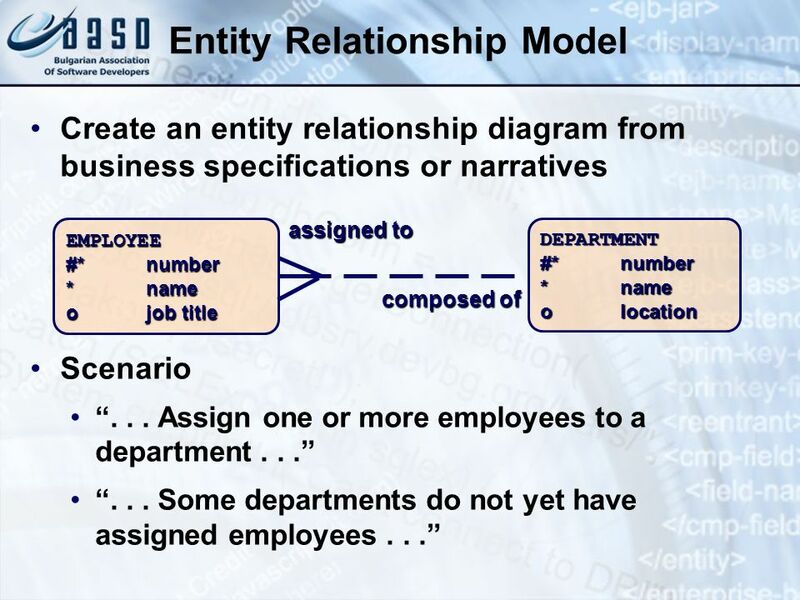 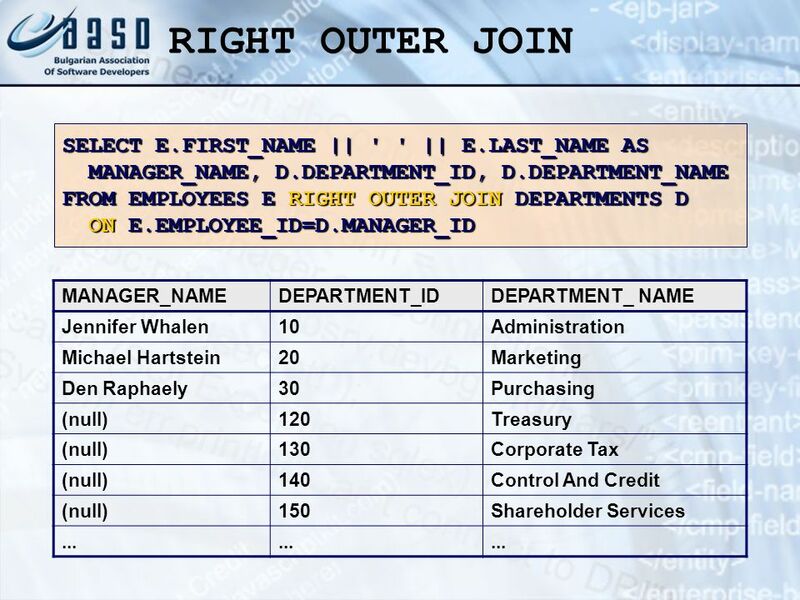 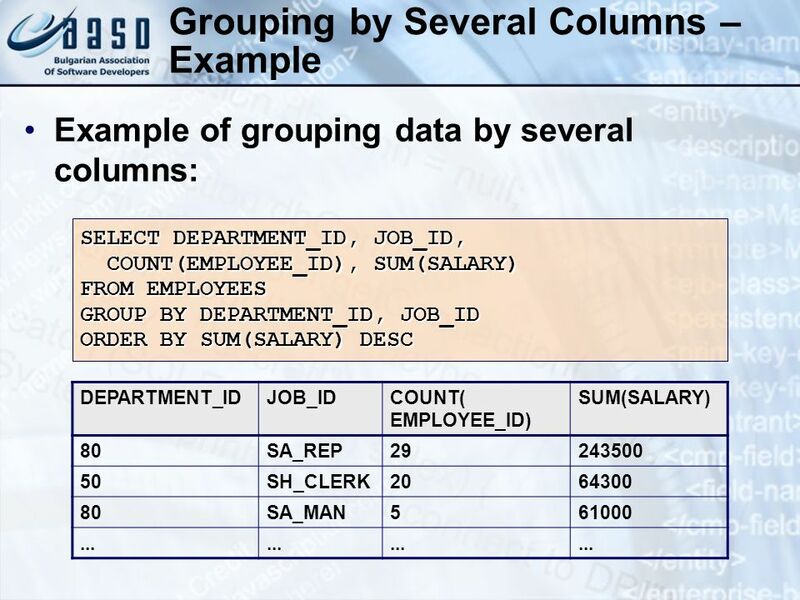 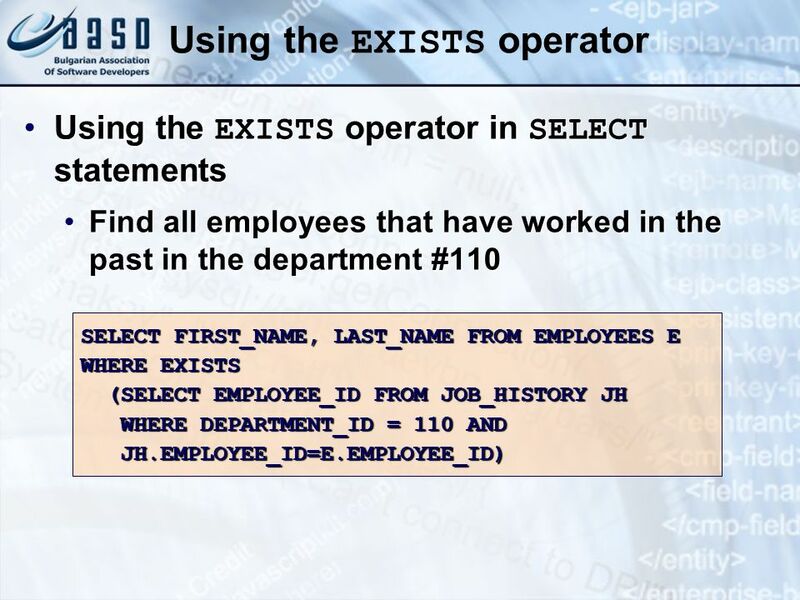 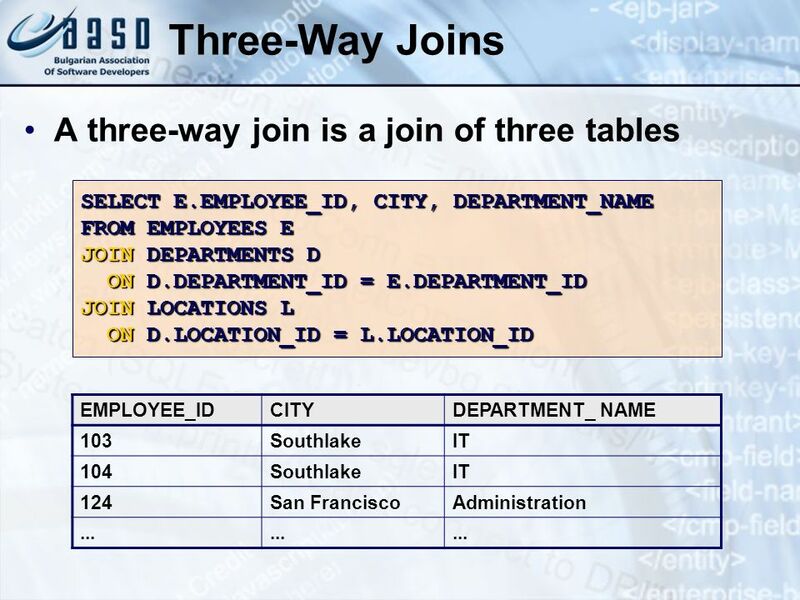 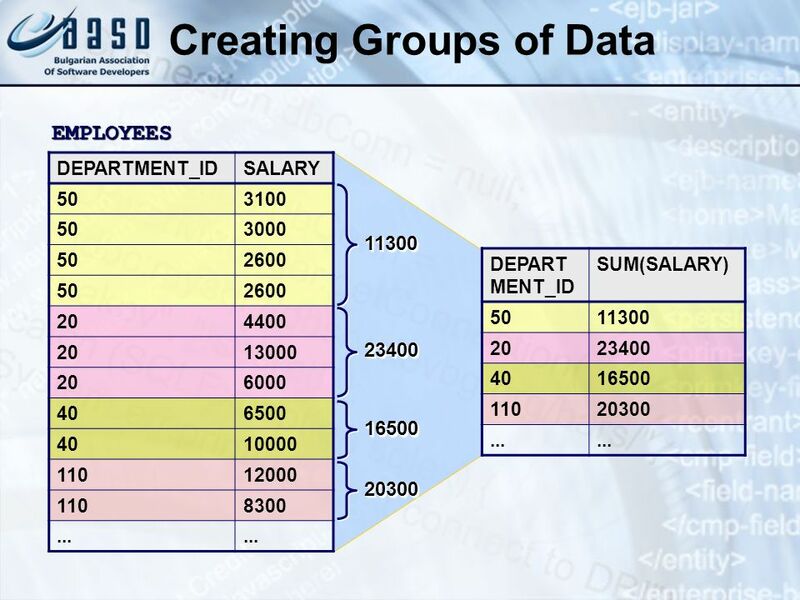 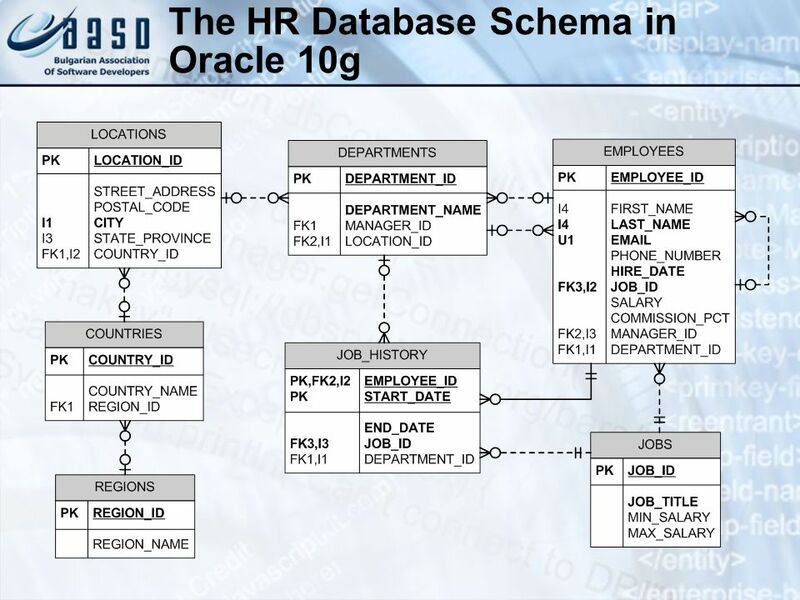 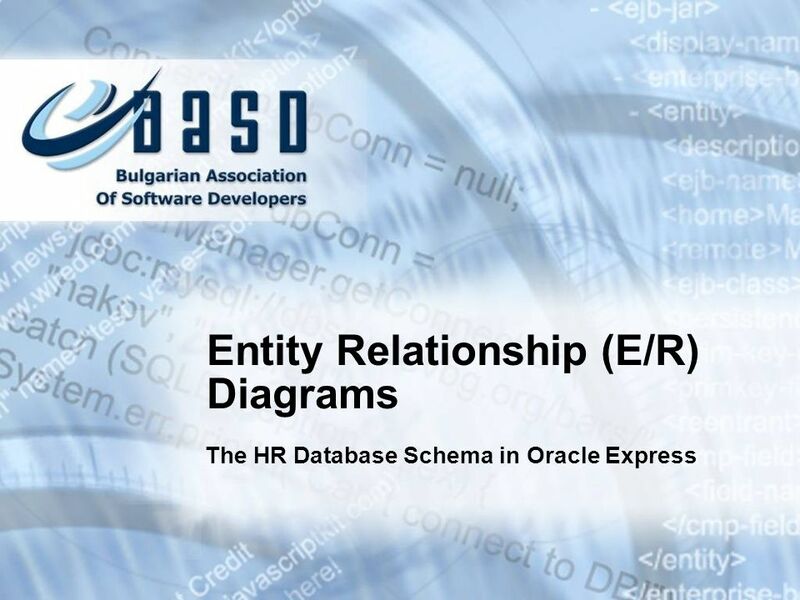 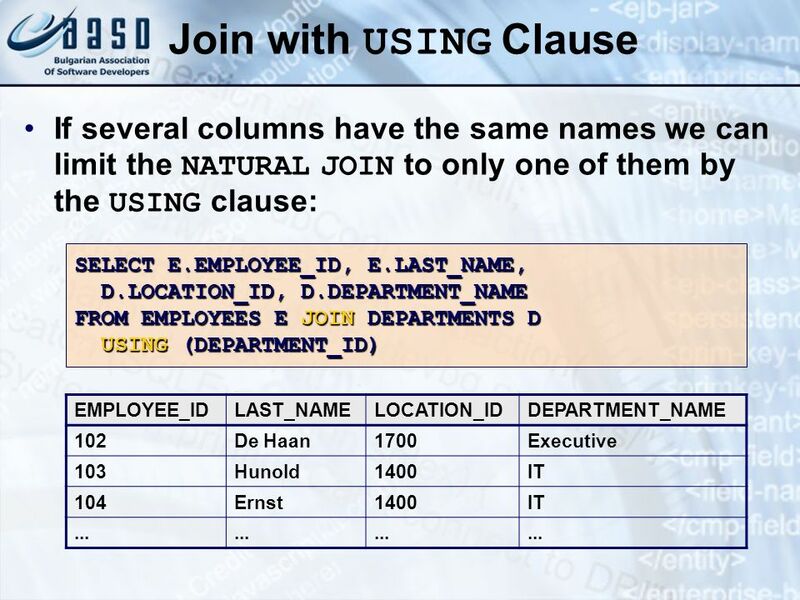 Write a SQL query to display the country of each employee along with his name and department city. 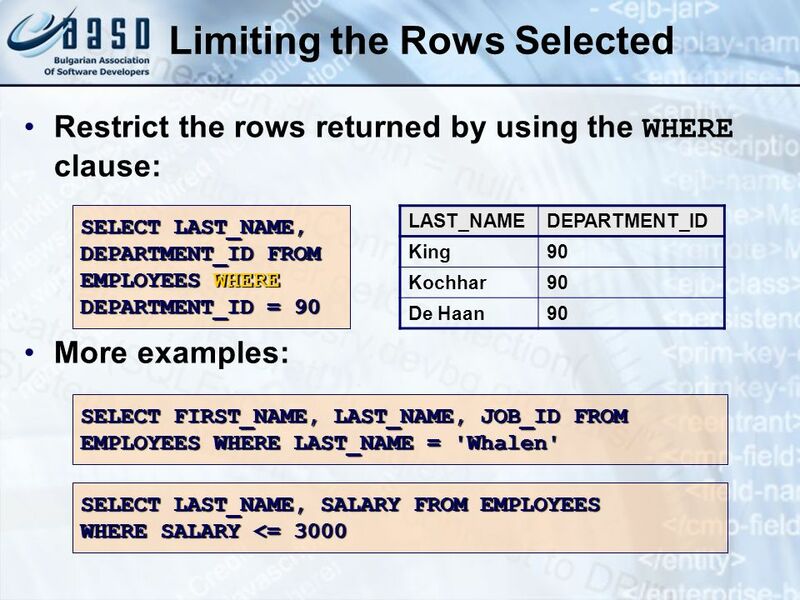 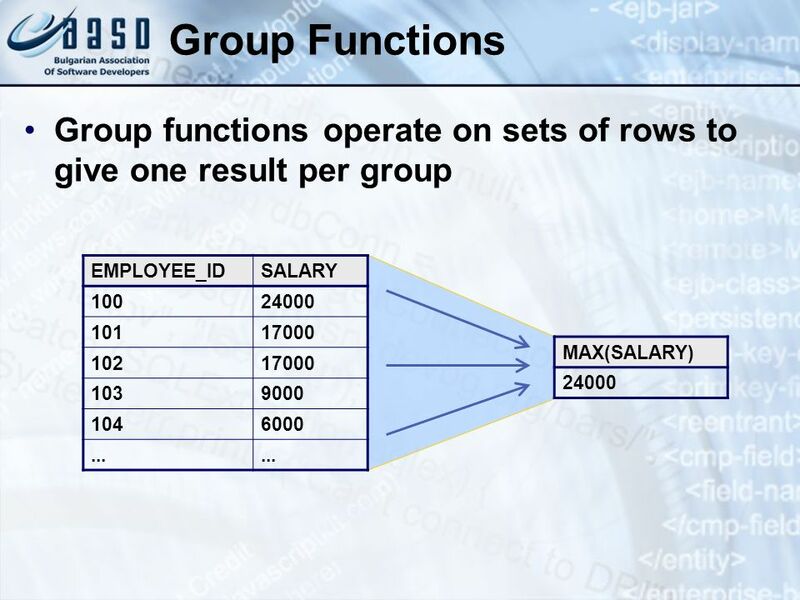 Write a SQL query to display the country where maximal number of employees work. 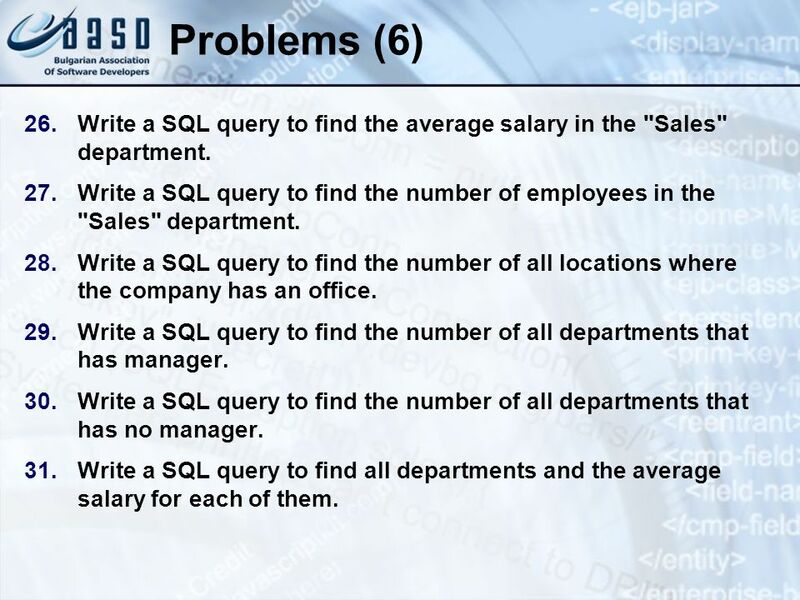 Write a SQL query to display the number of managers for each region and each country. 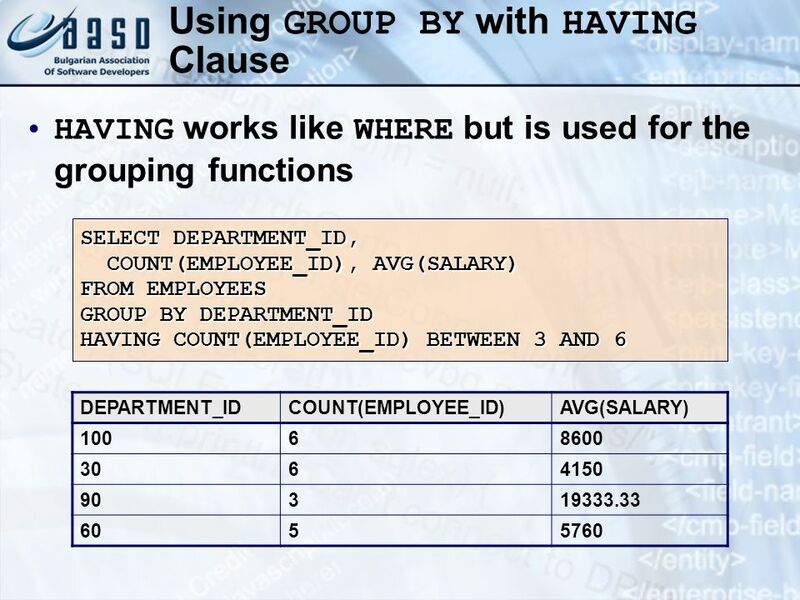 Define table WORKHOURS to store work reports for each employee (date, task, hours, comments). 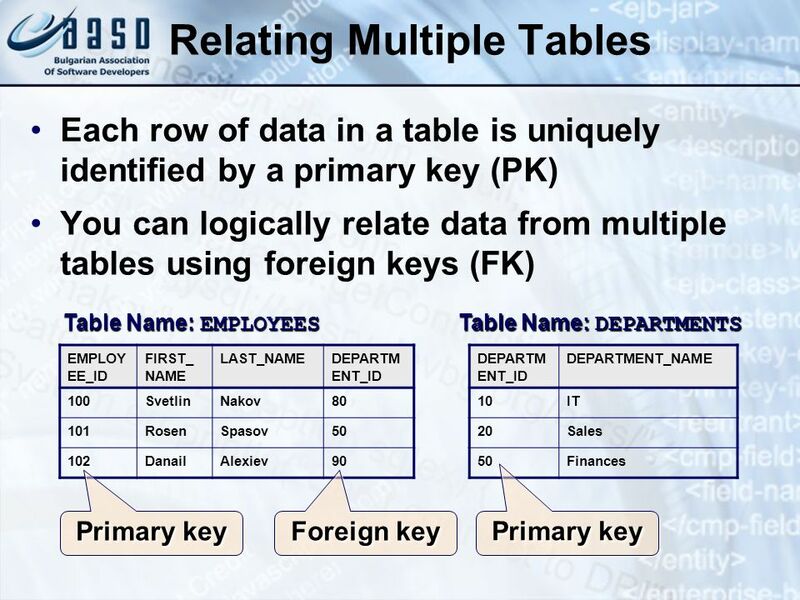 Don't forget to define automatically populated primary key (primary key constraint + sequence + trigger). 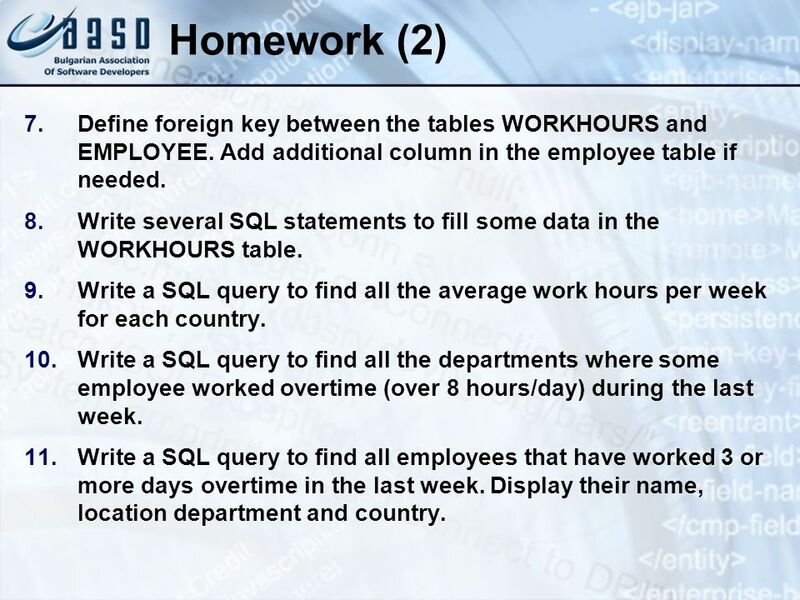 97 Homework (2) Define foreign key between the tables WORKHOURS and EMPLOYEE. 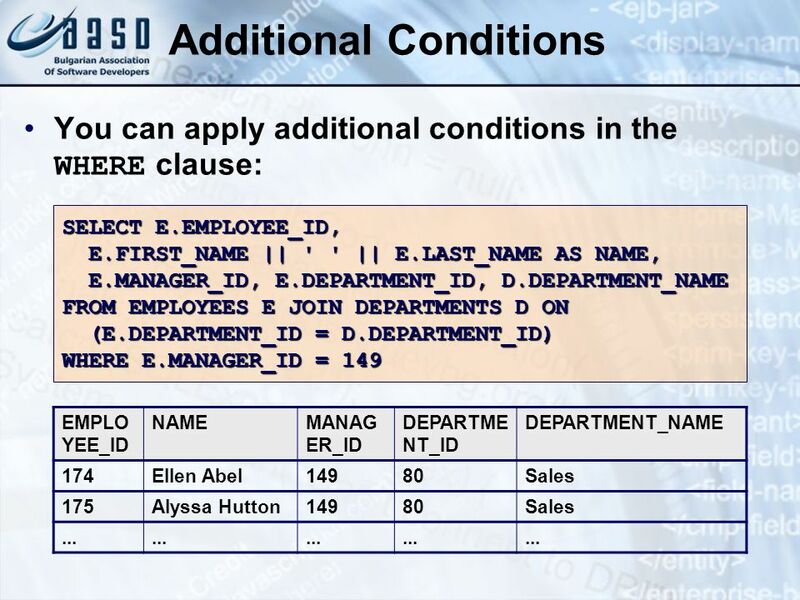 Add additional column in the employee table if needed. 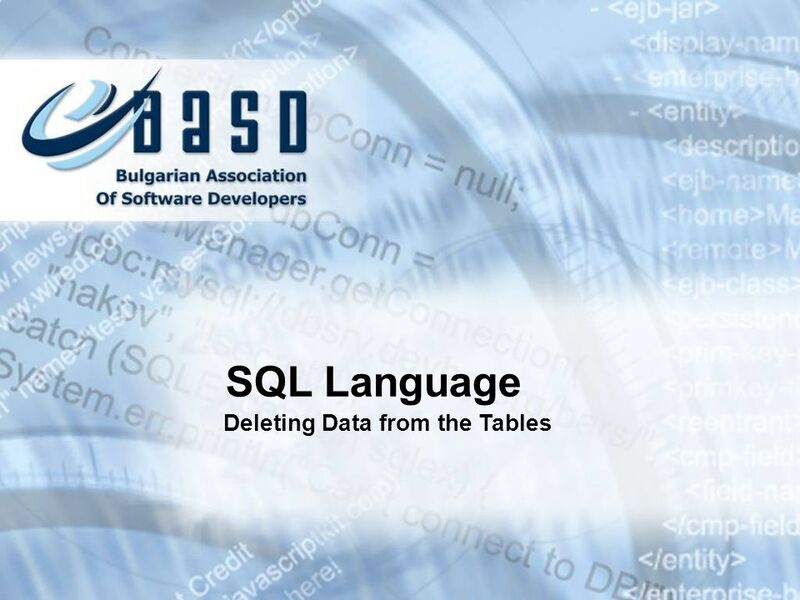 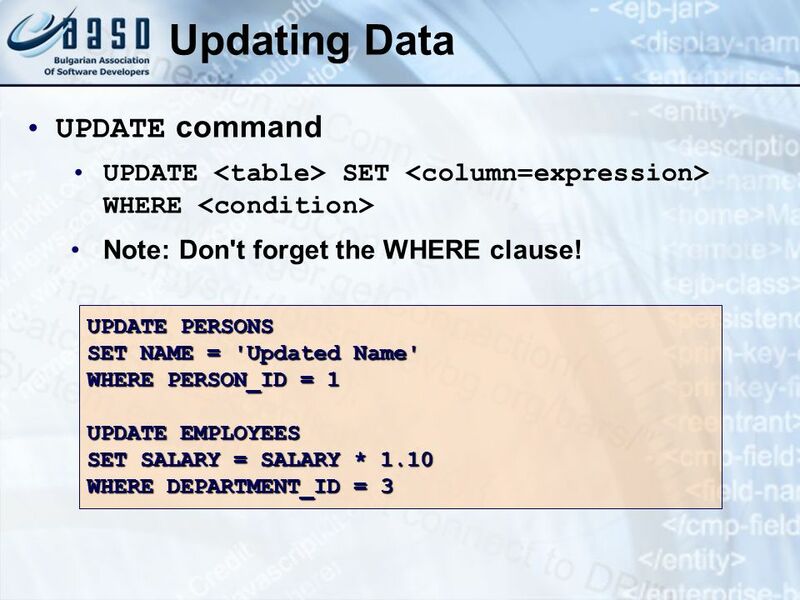 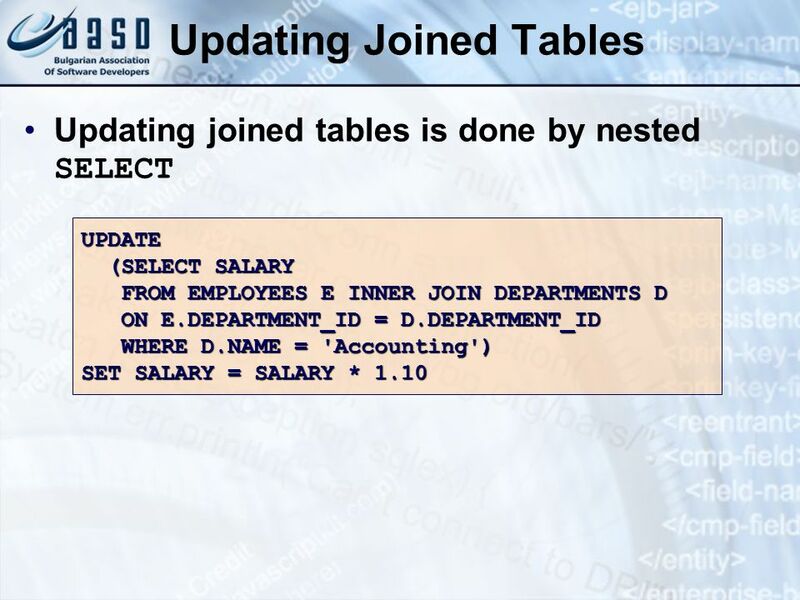 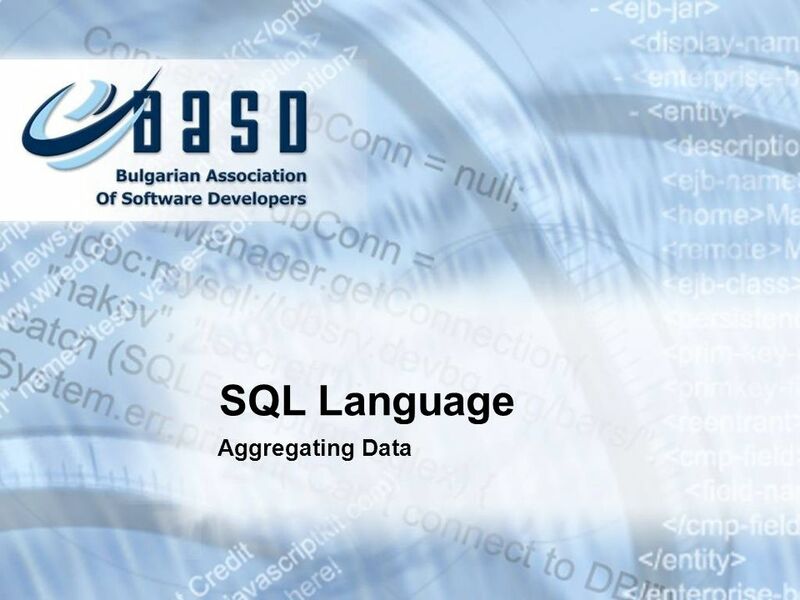 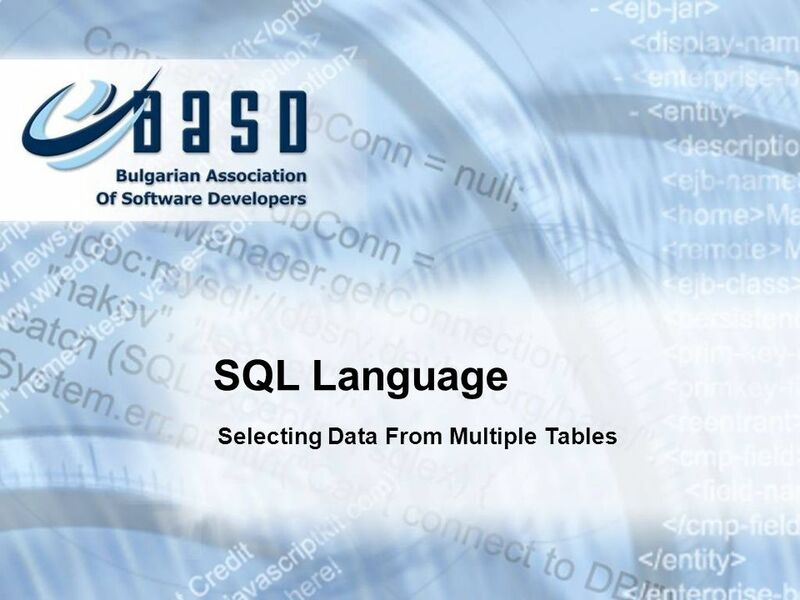 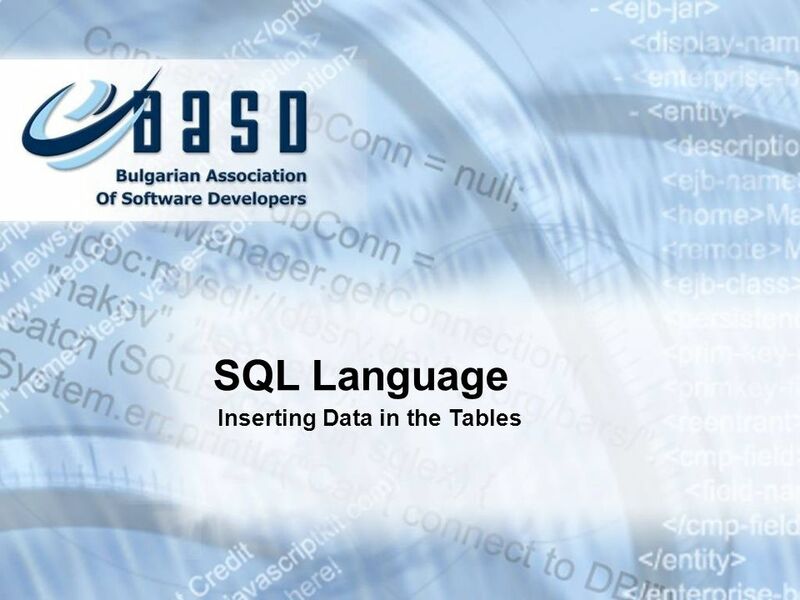 Write several SQL statements to fill some data in the WORKHOURS table. 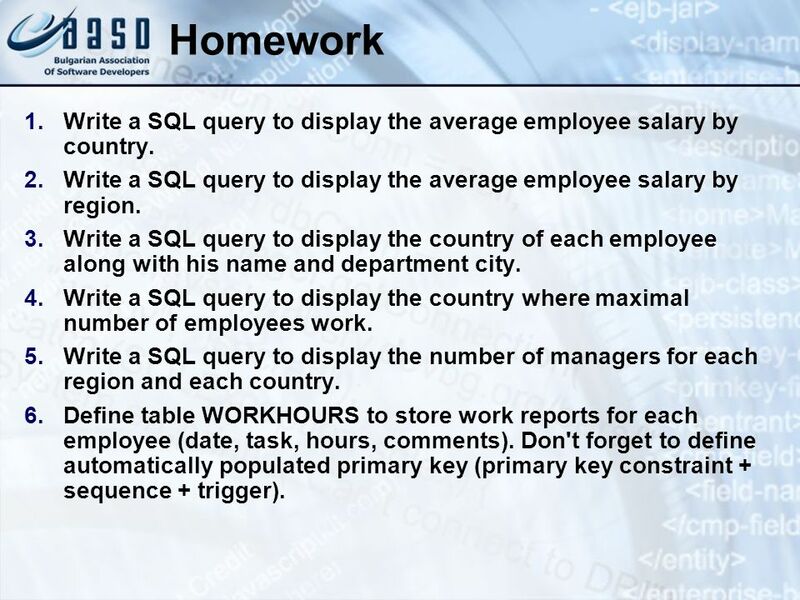 Write a SQL query to find all the average work hours per week for each country. 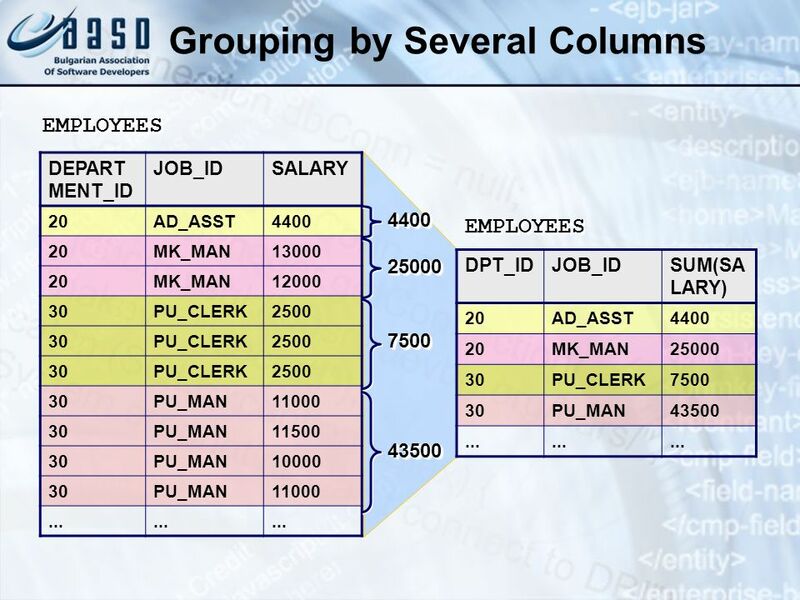 Write a SQL query to find all the departments where some employee worked overtime (over 8 hours/day) during the last week. 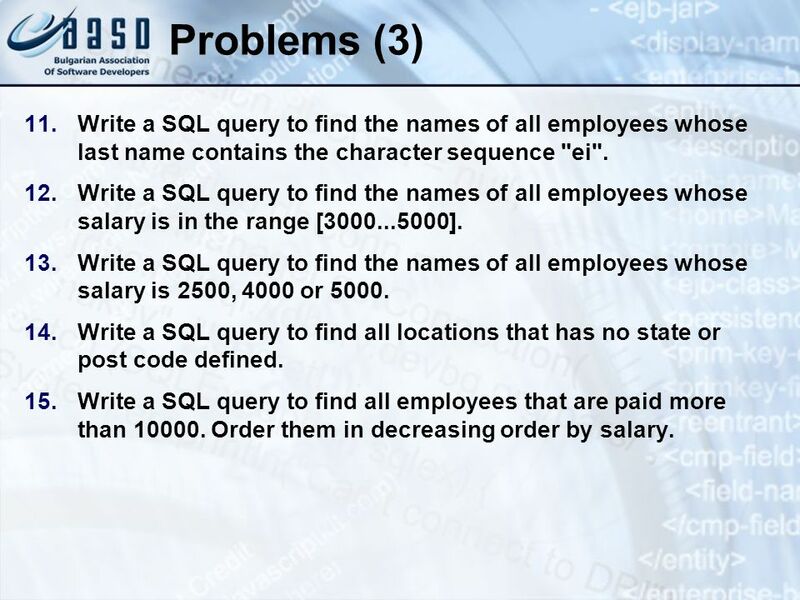 Write a SQL query to find all employees that have worked 3 or more days overtime in the last week. 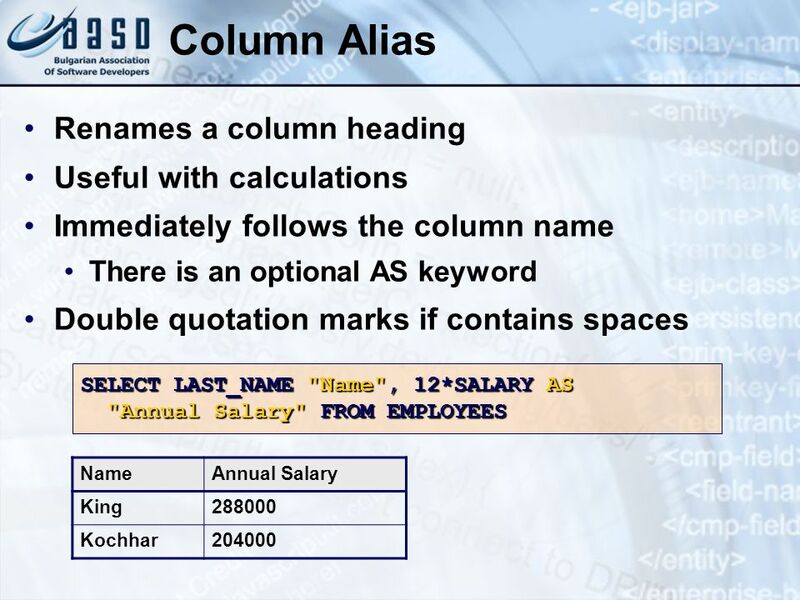 Display their name, location department and country. 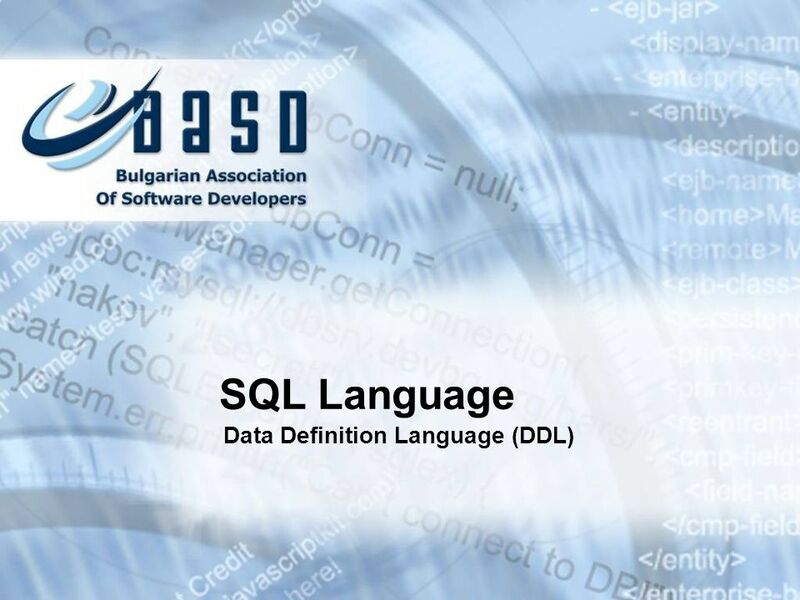 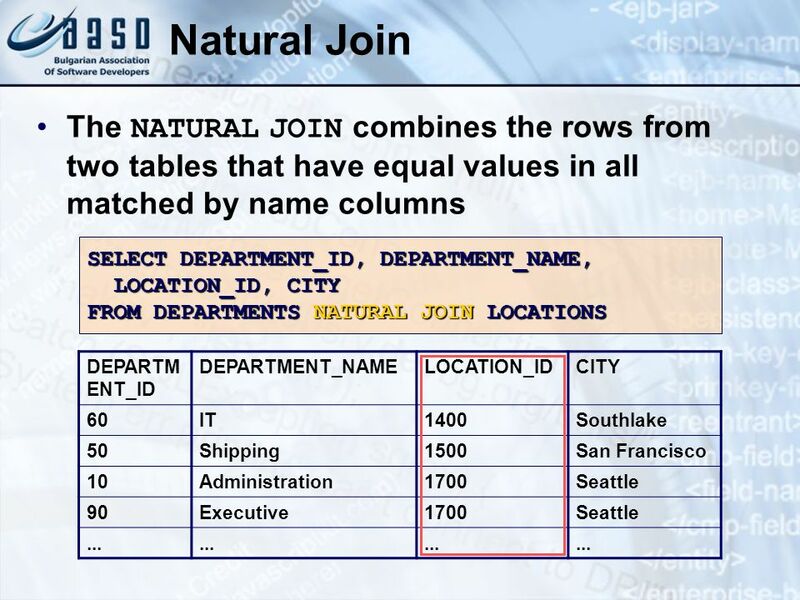 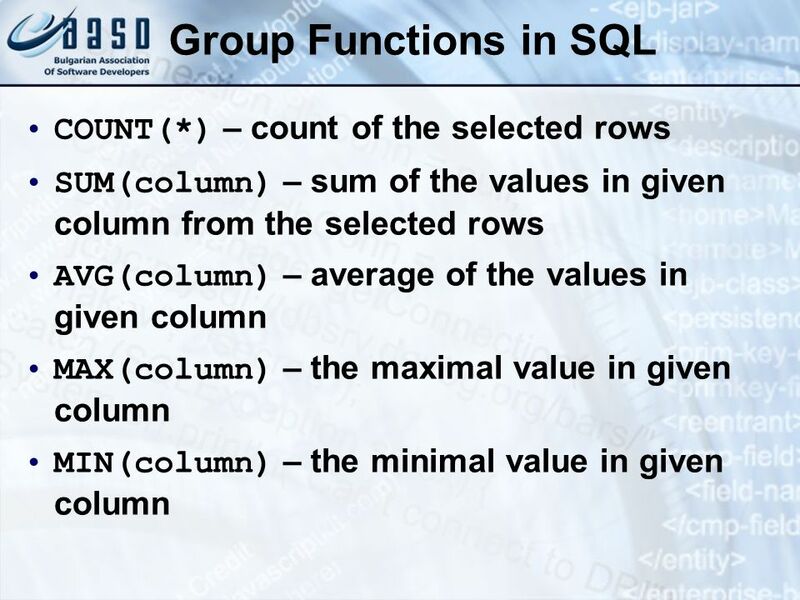 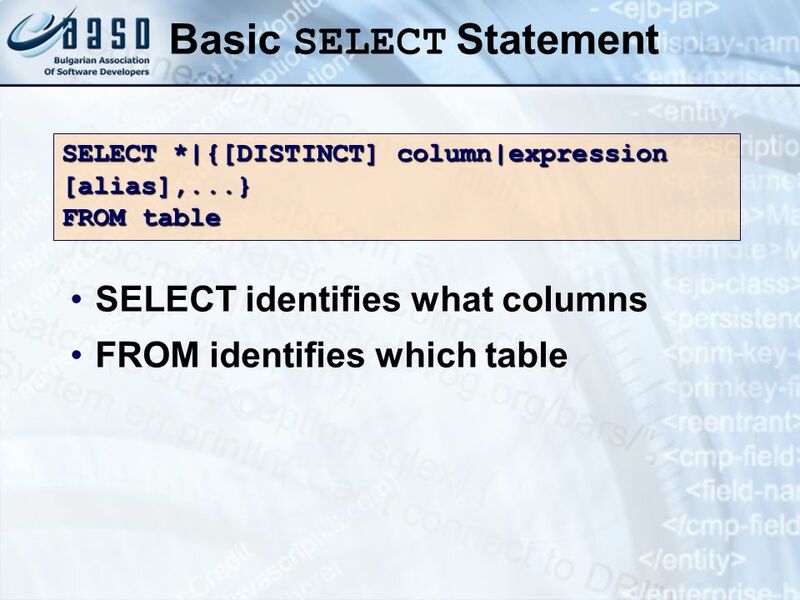 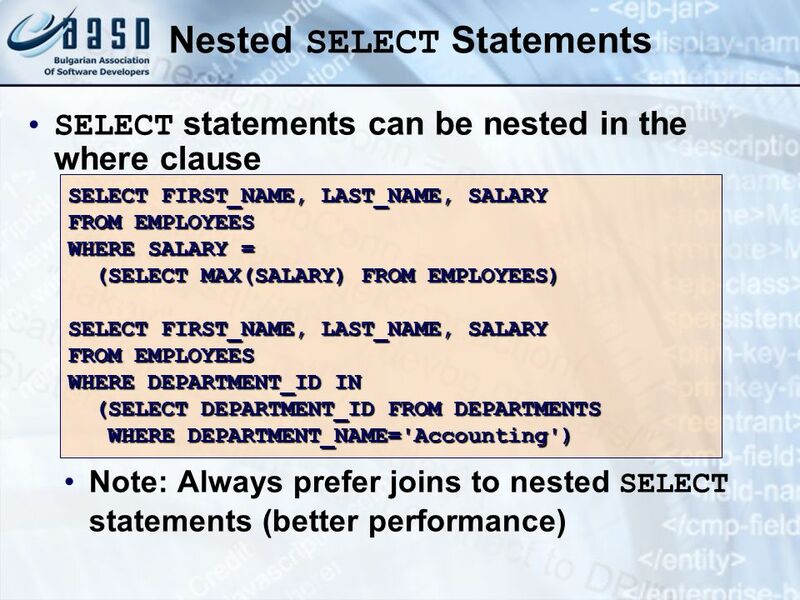 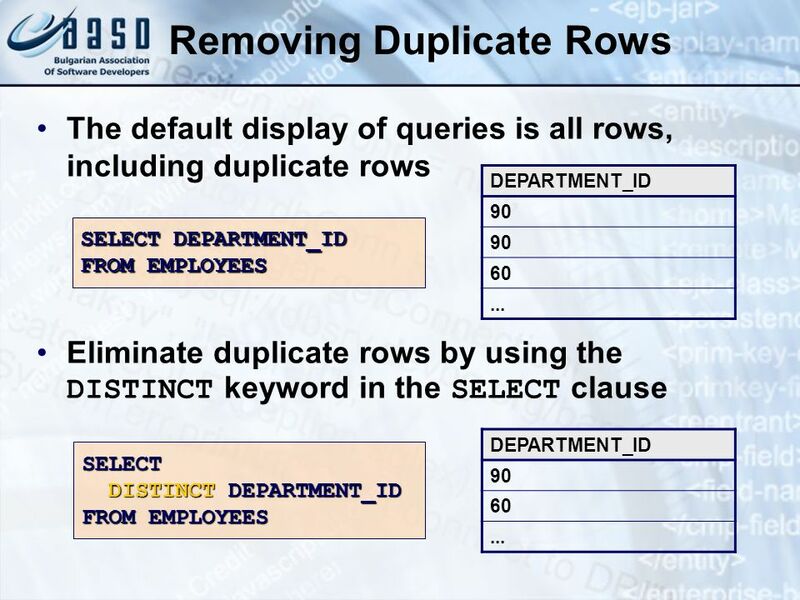 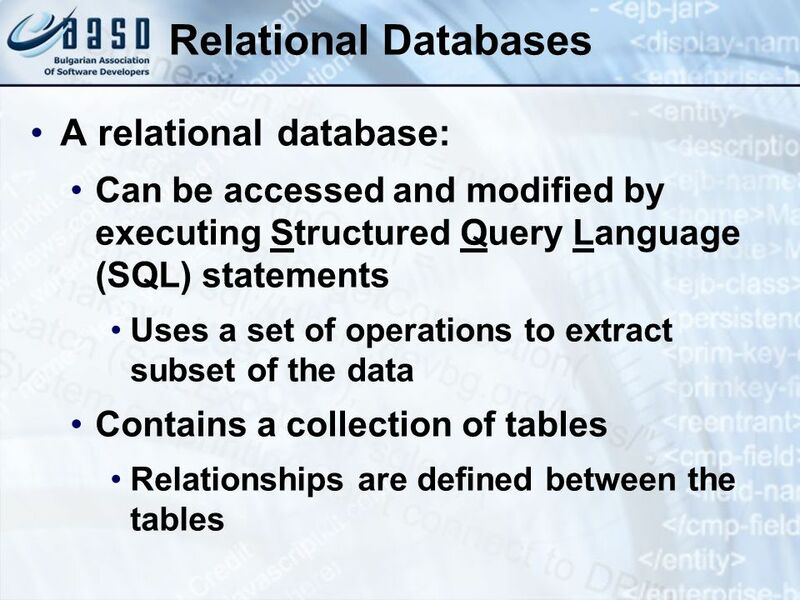 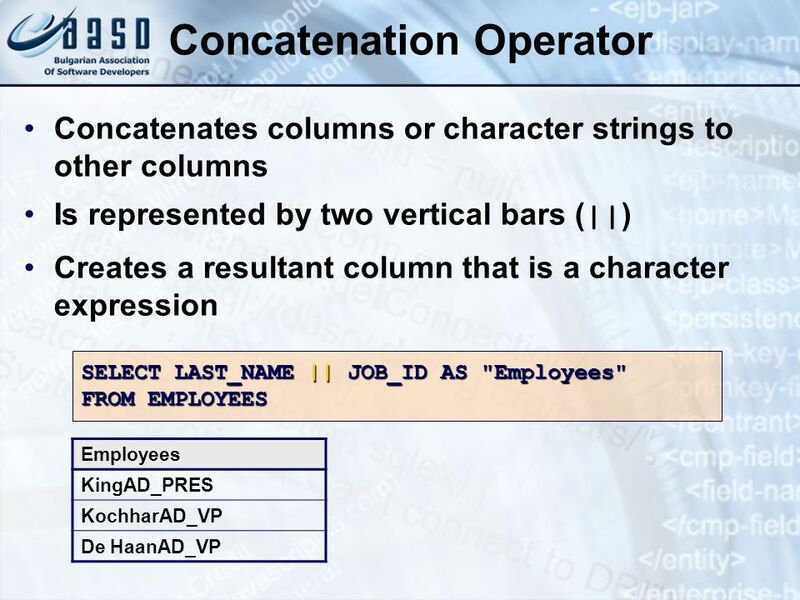 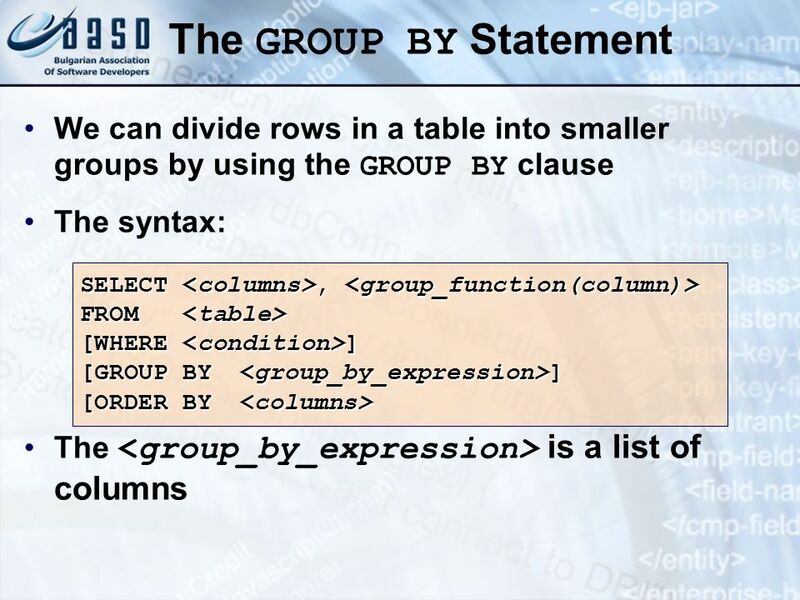 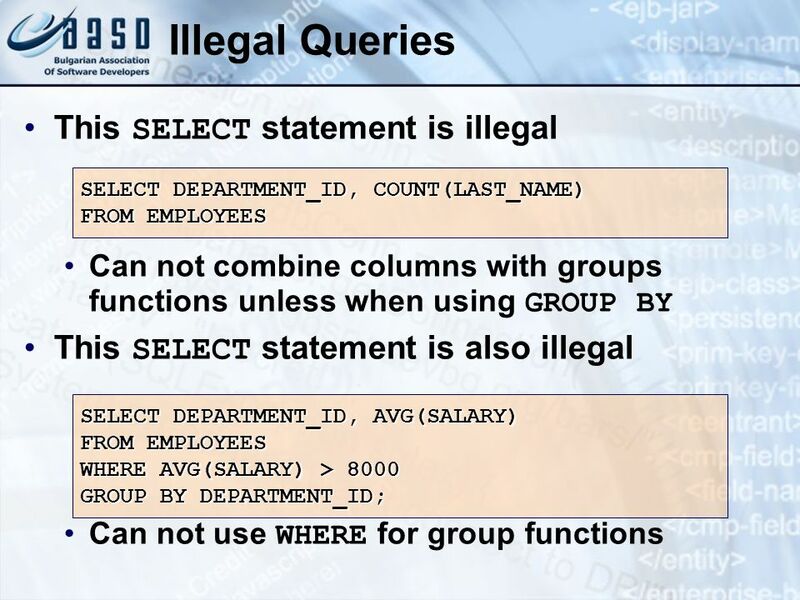 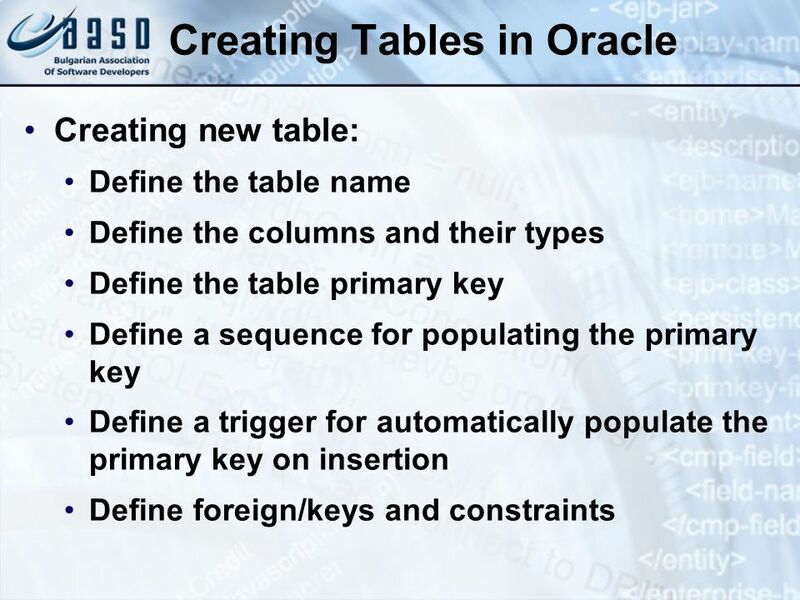 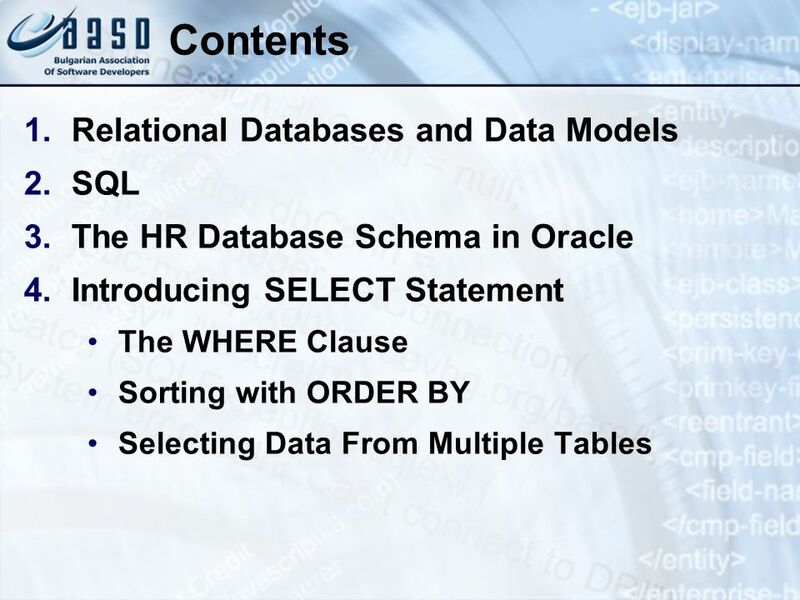 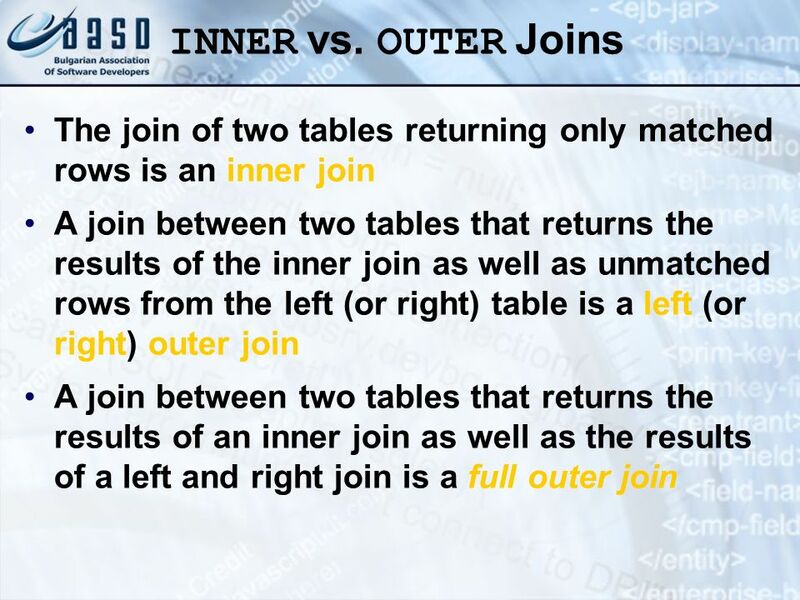 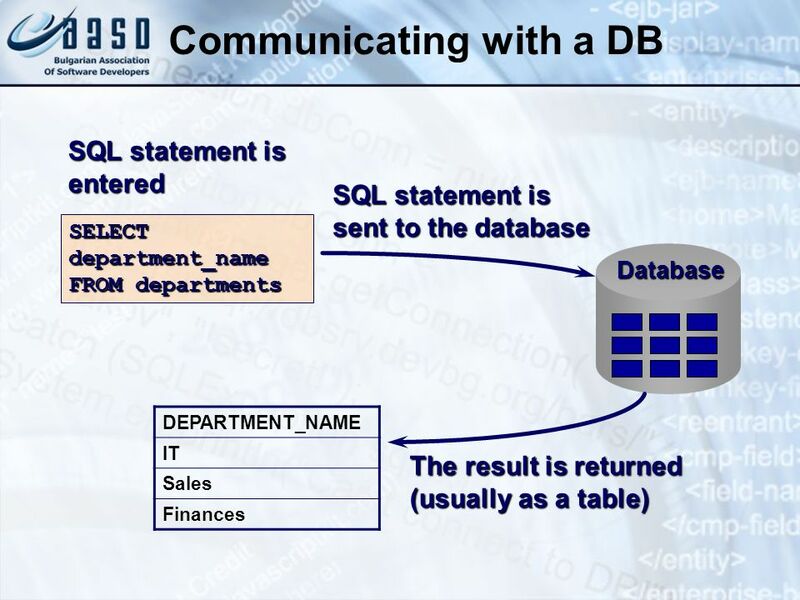 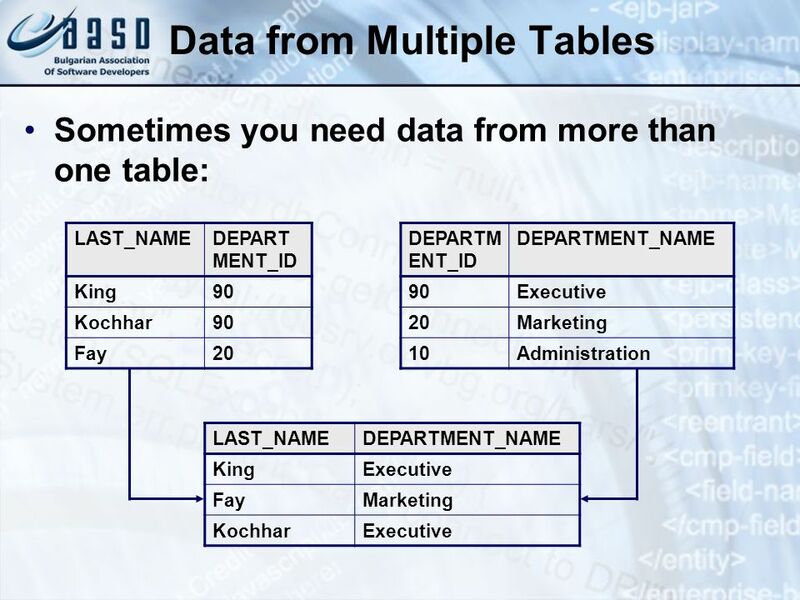 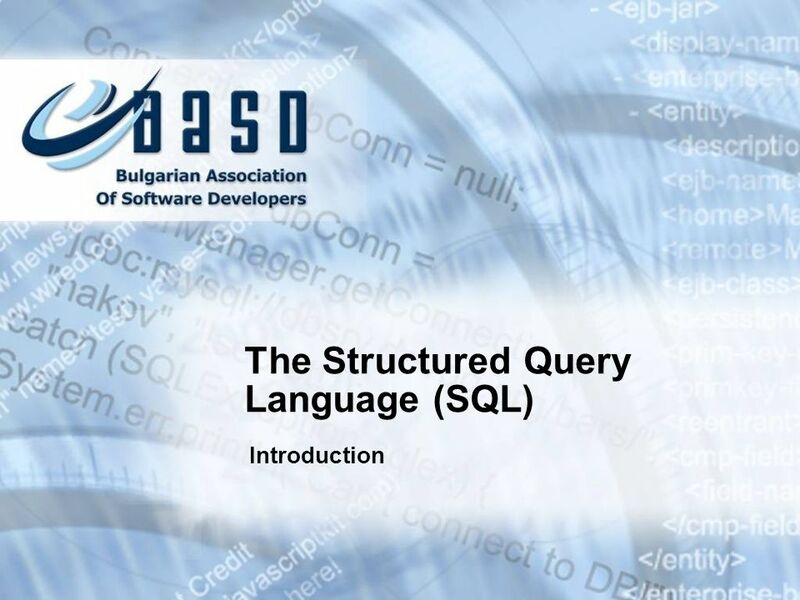 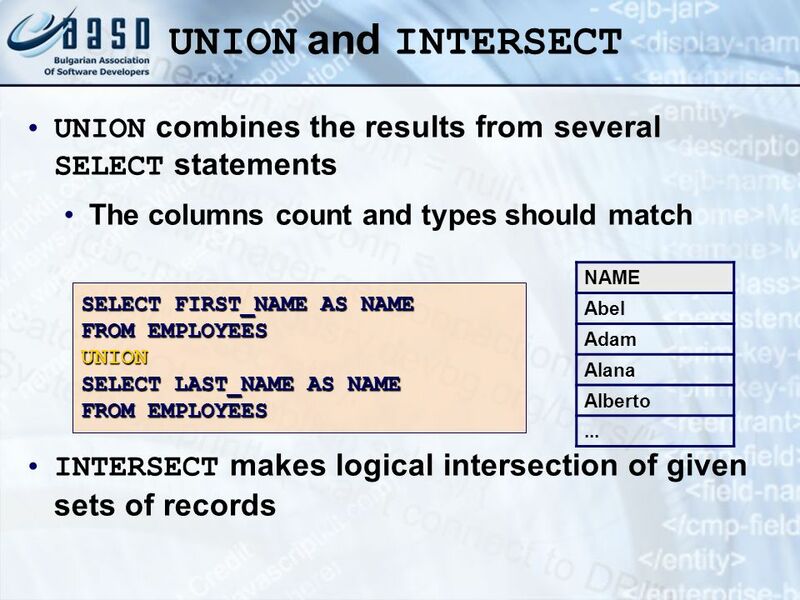 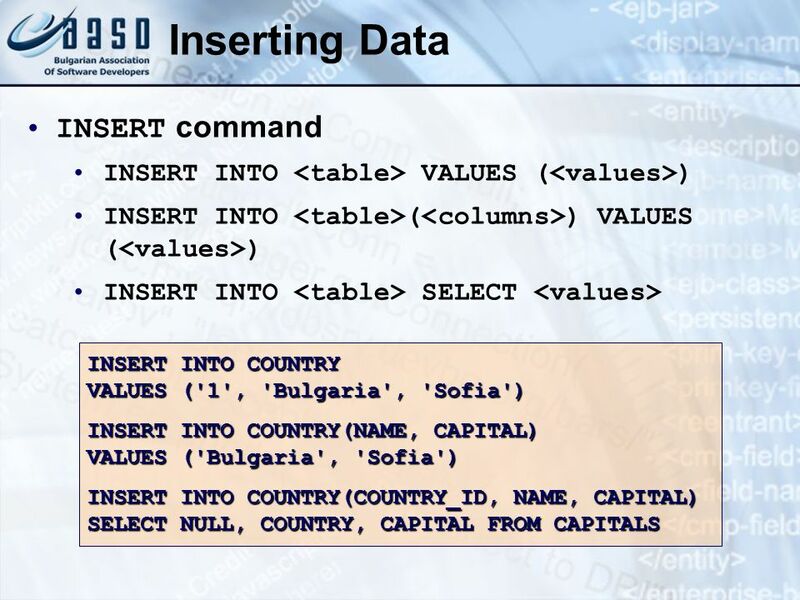 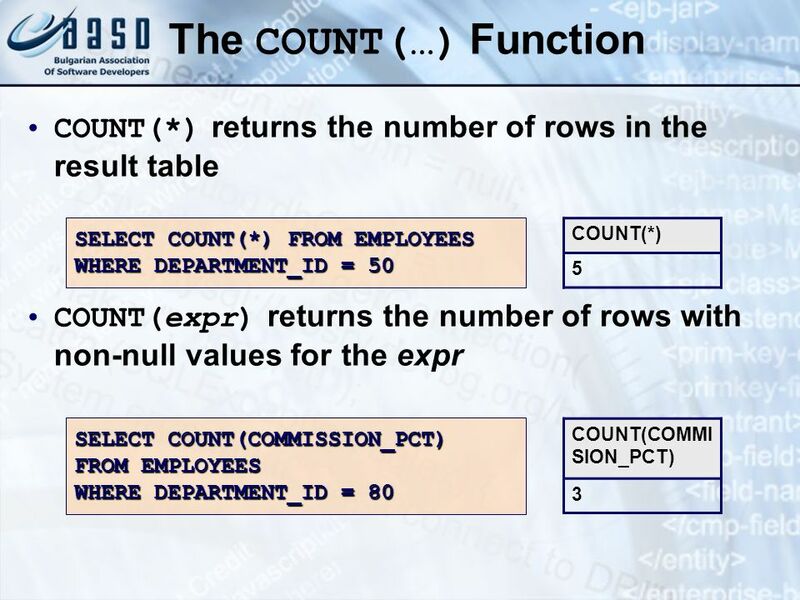 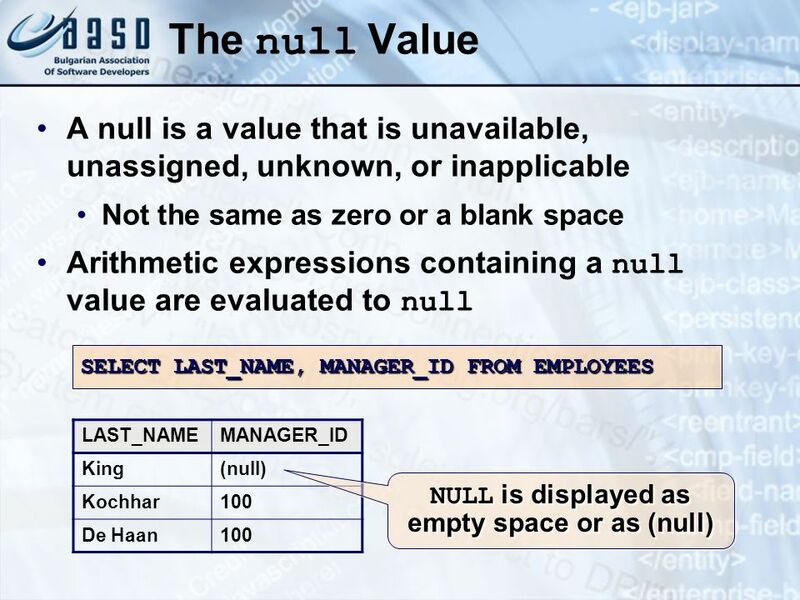 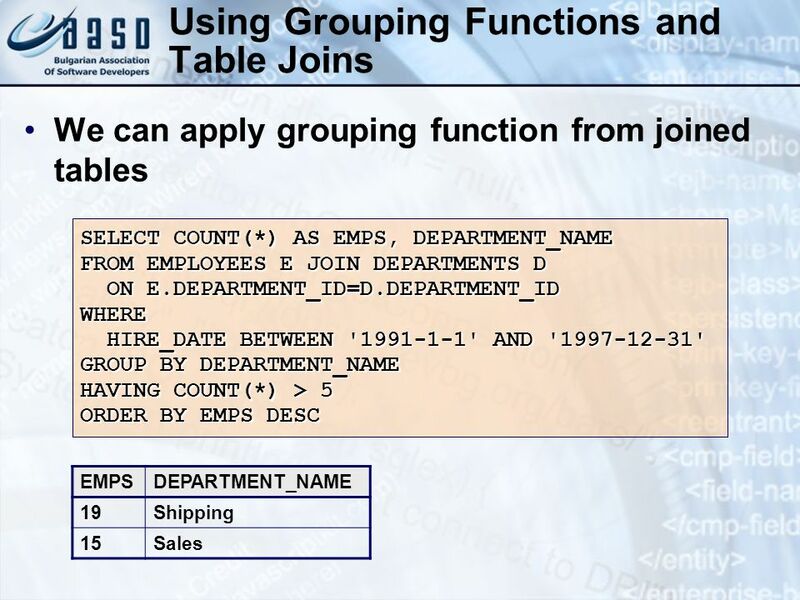 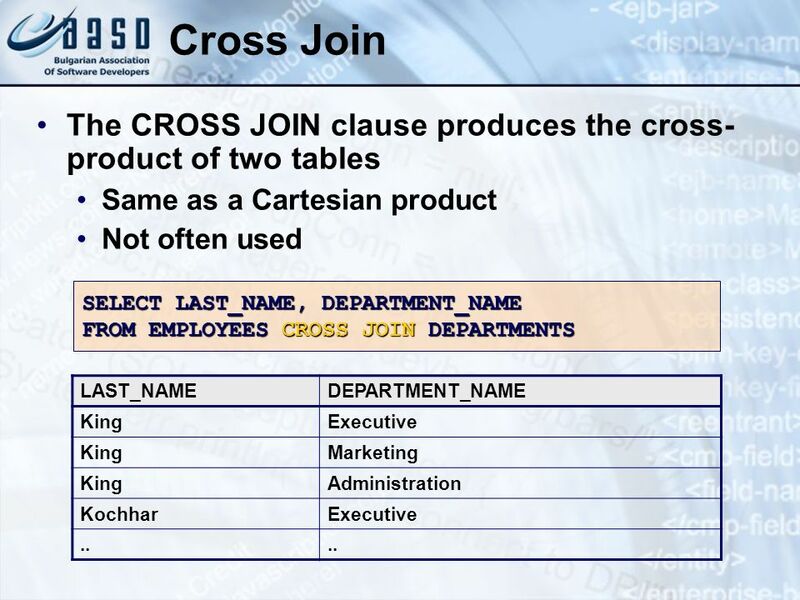 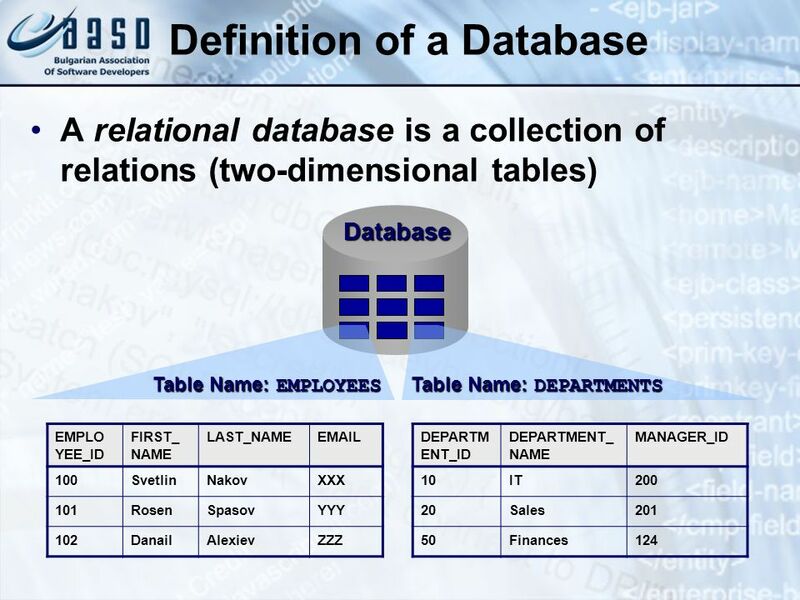 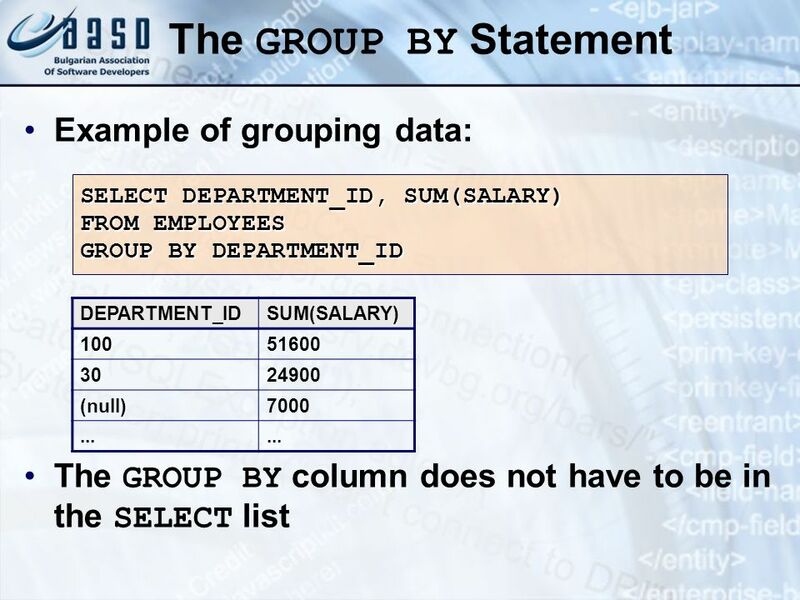 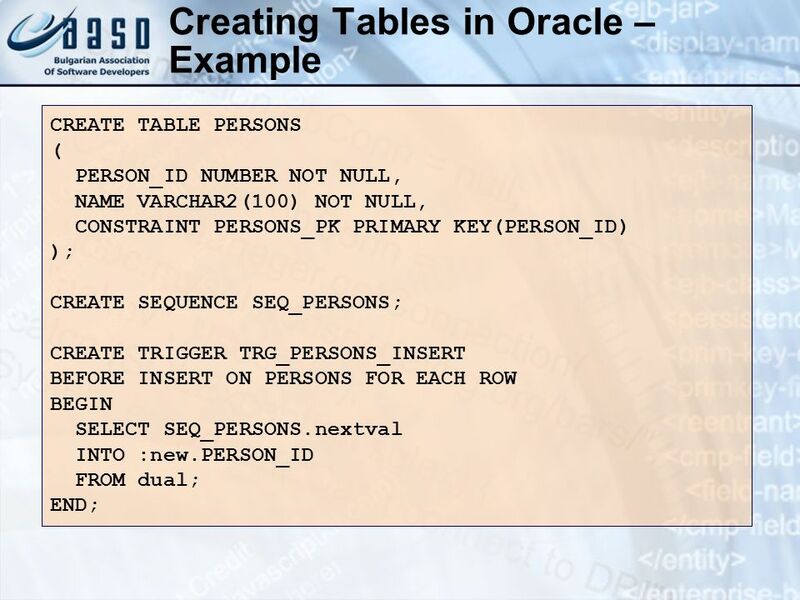 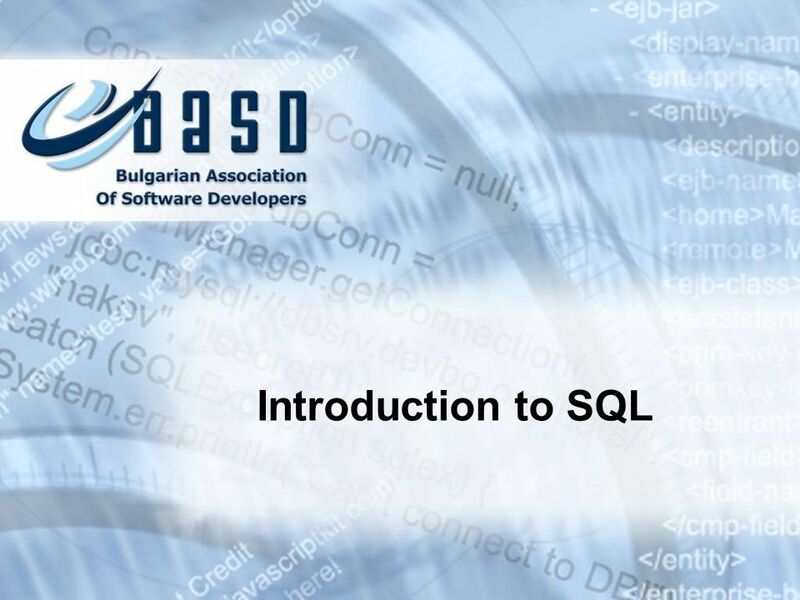 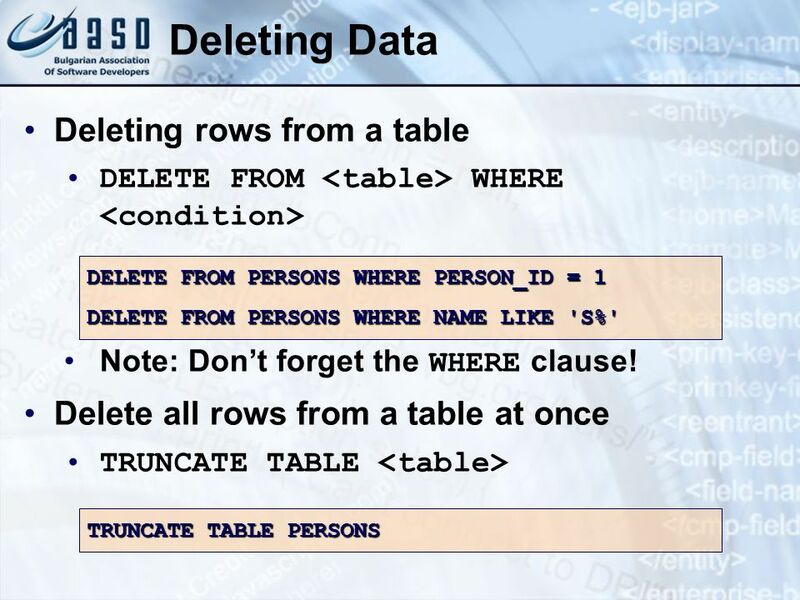 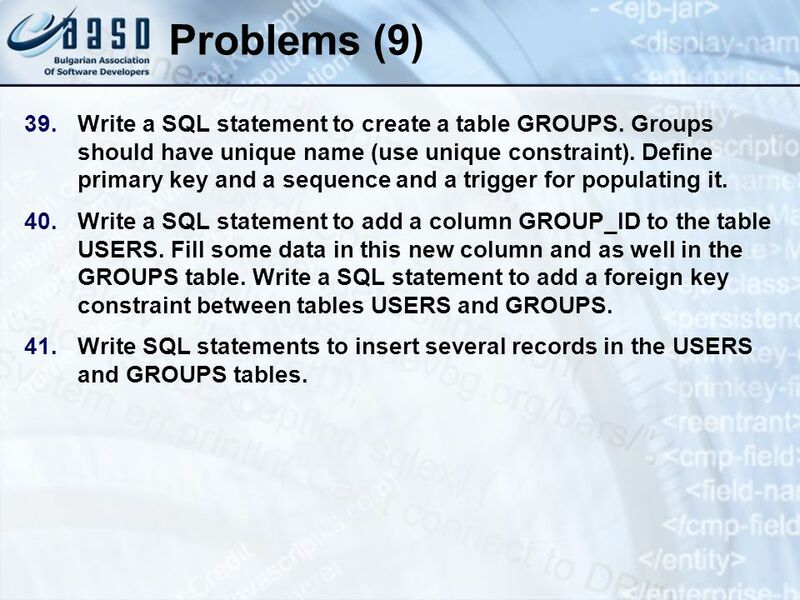 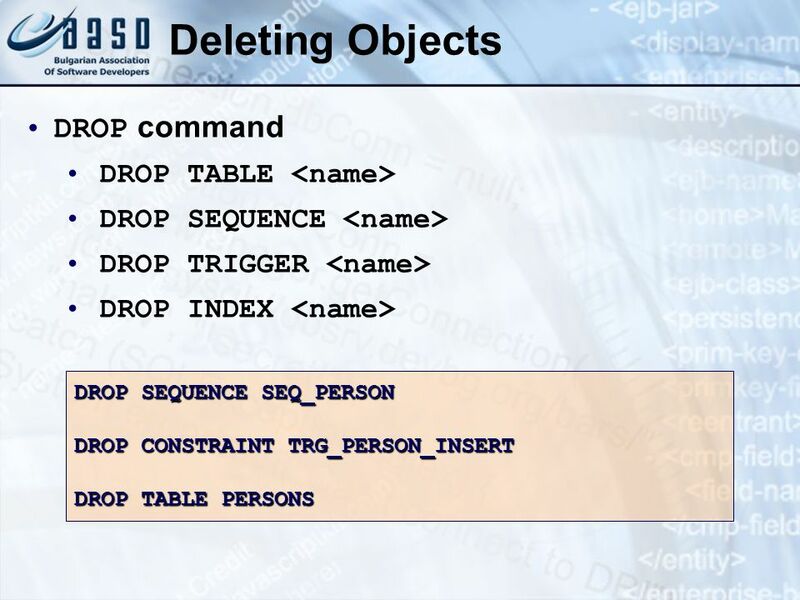 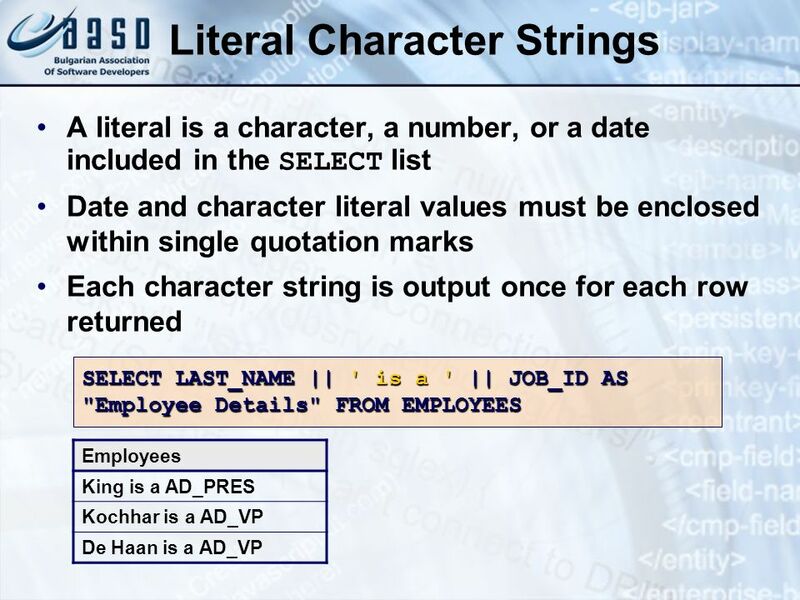 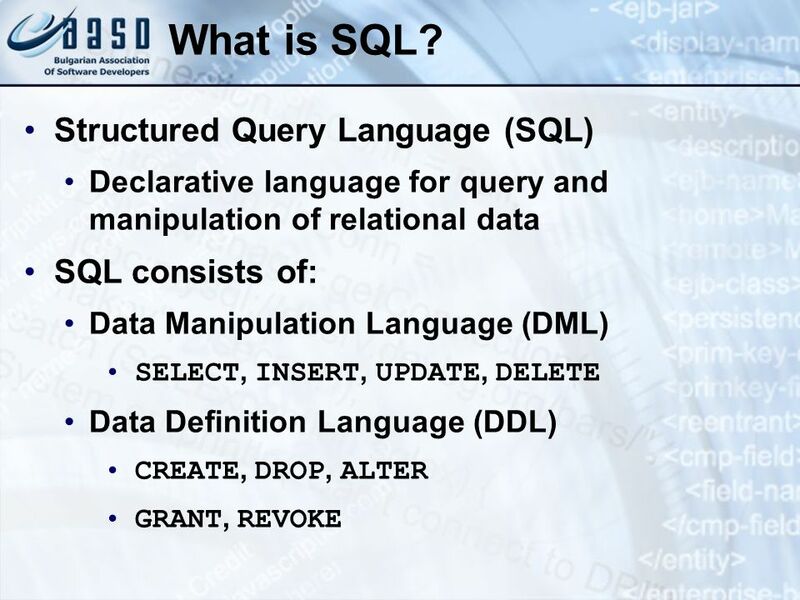 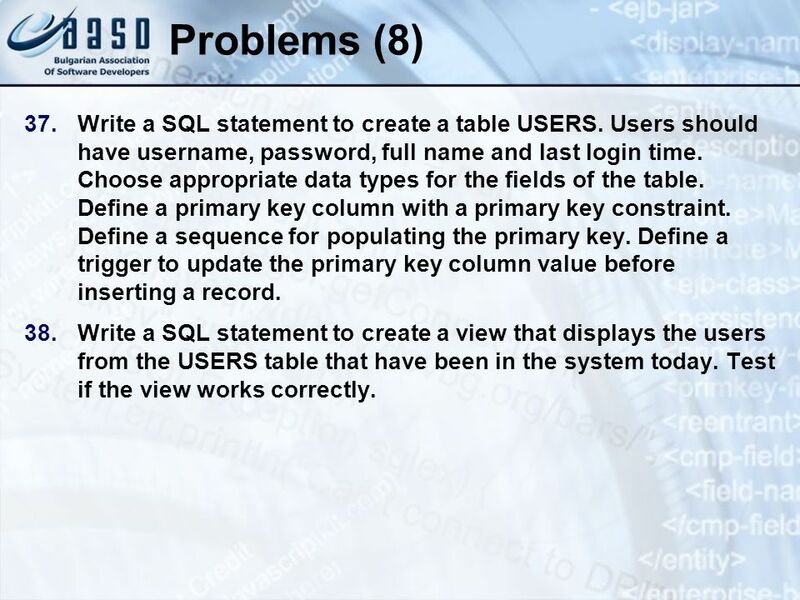 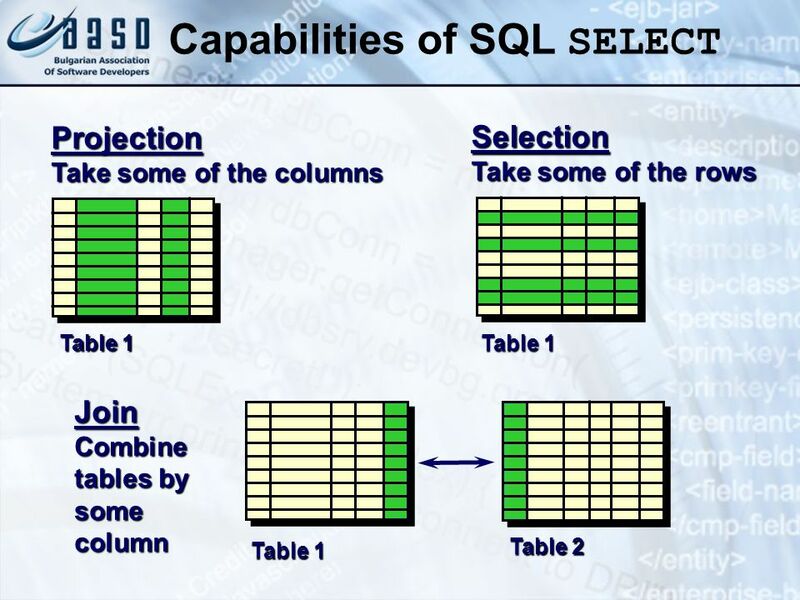 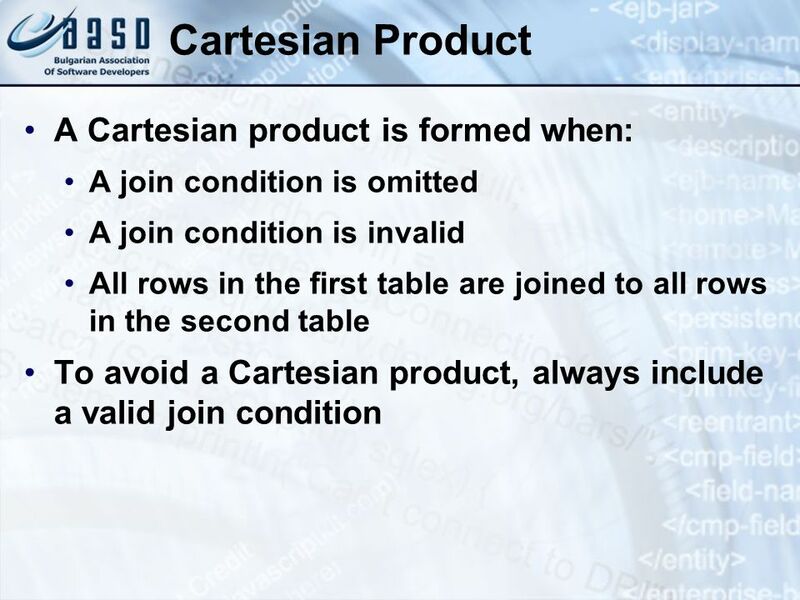 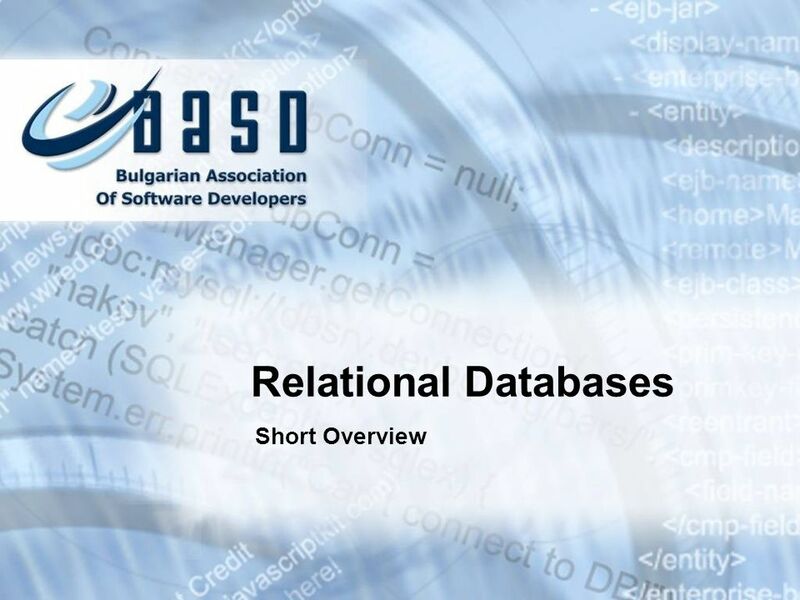 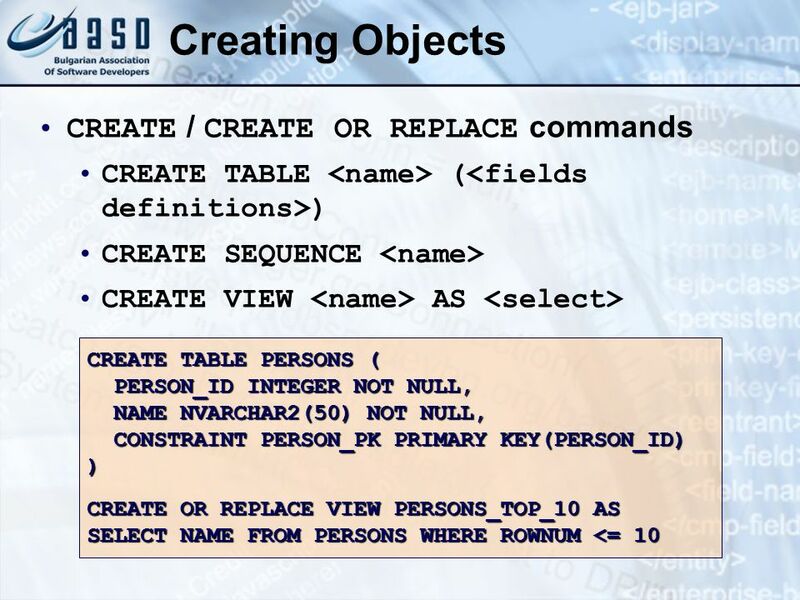 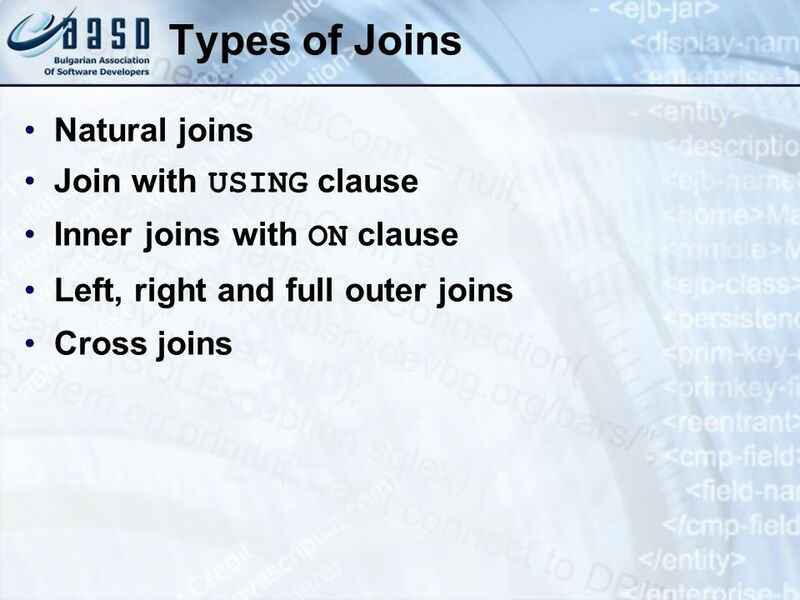 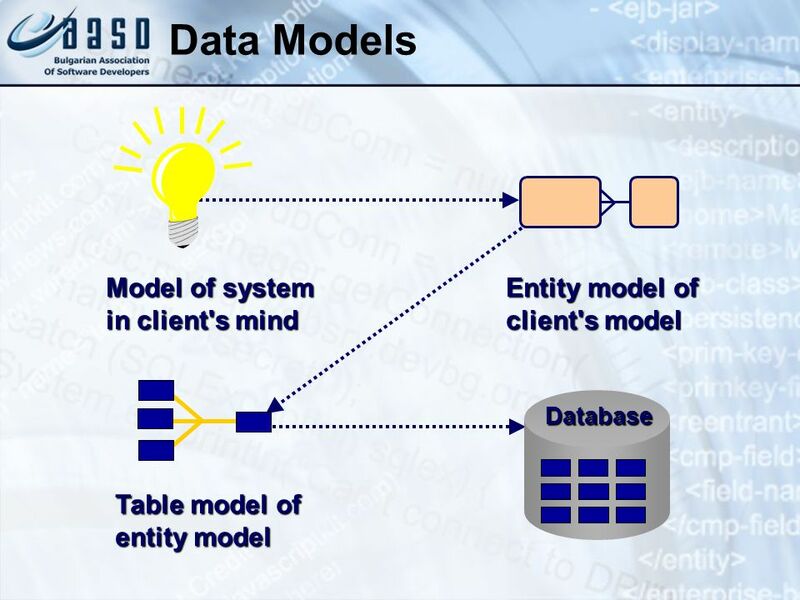 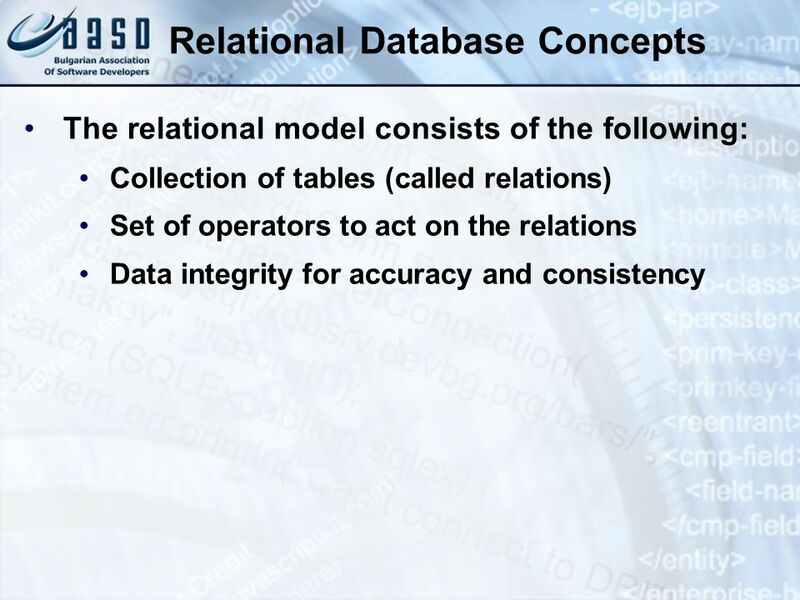 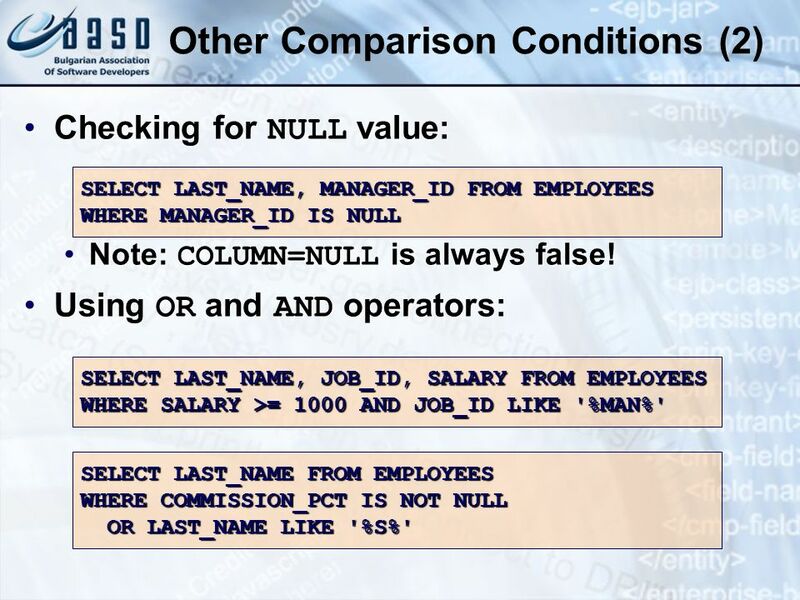 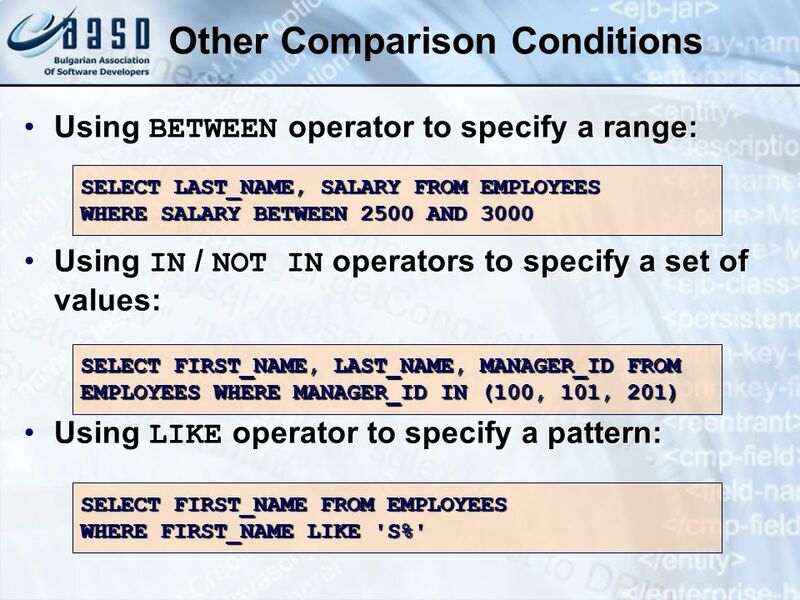 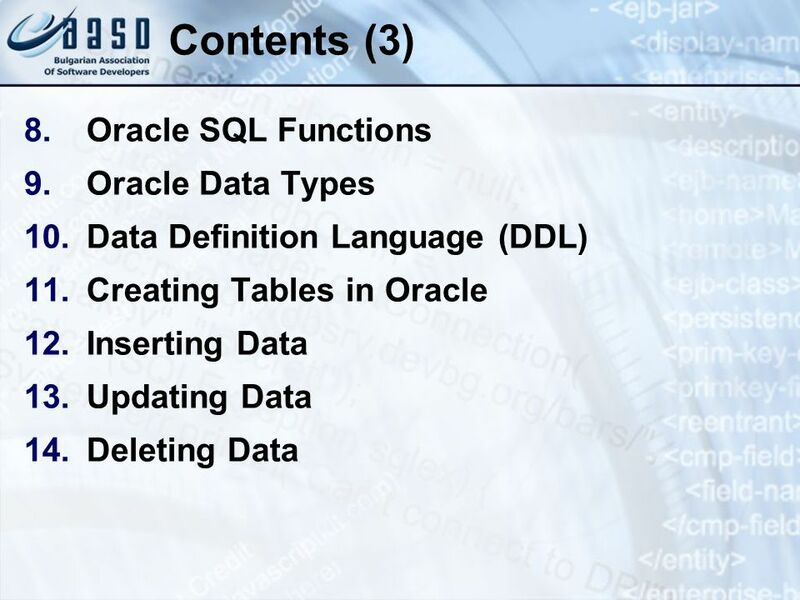 Download ppt "Introduction to SQL * 07/16/96"
Creating Tables, Setting Constraints, and Datatypes What is a constraint and why do we use it? 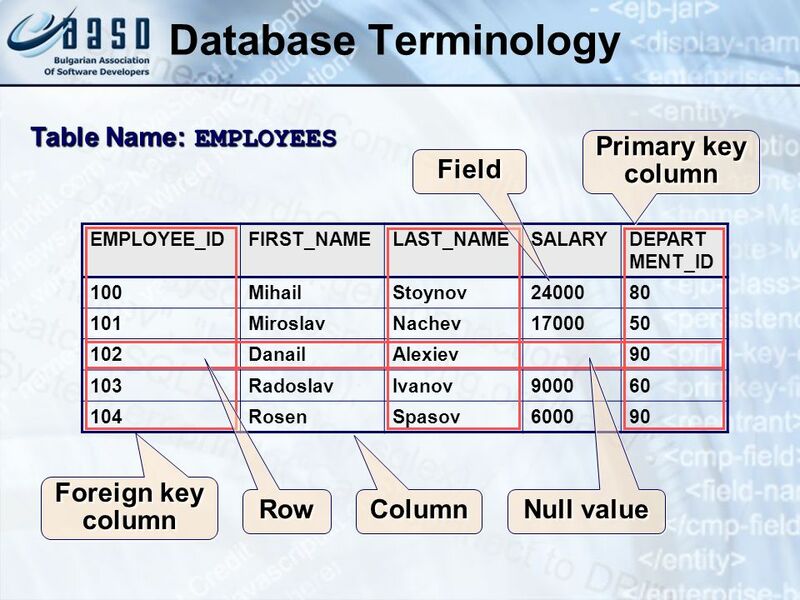 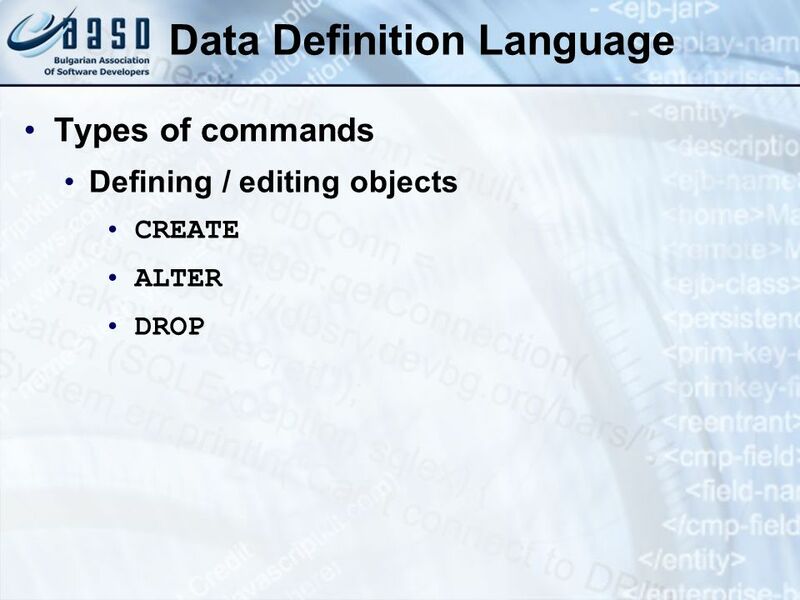 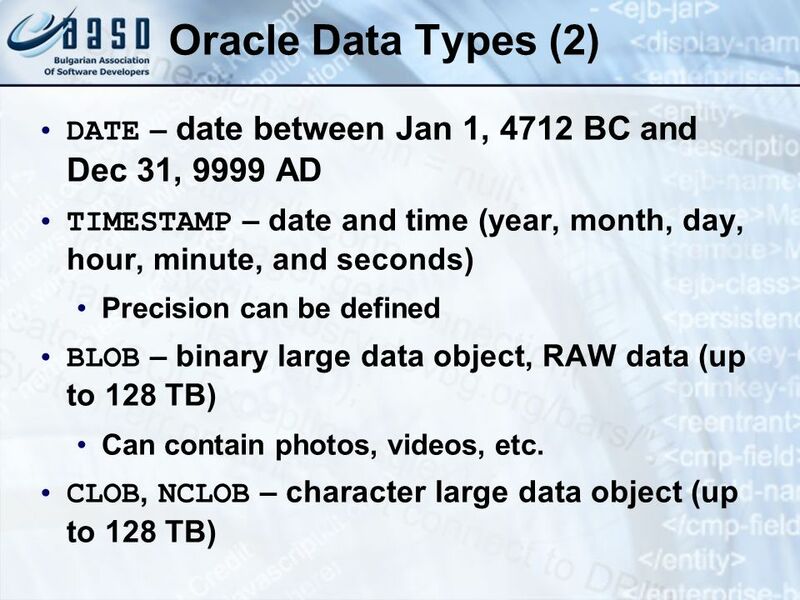 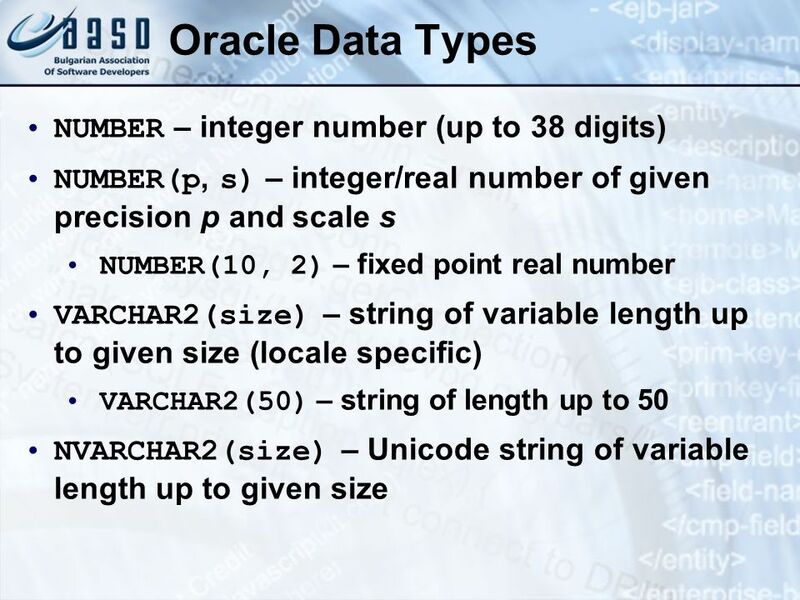 What is a datatype? 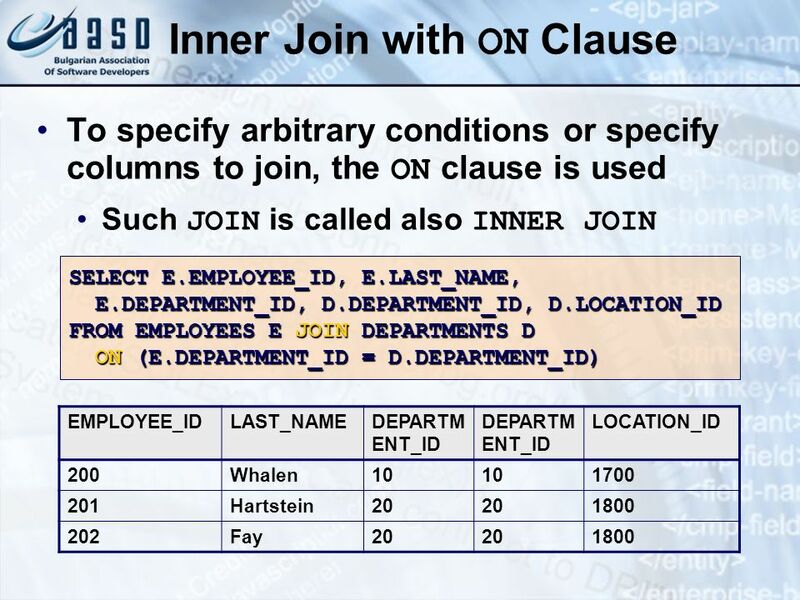 What does CHAR mean? 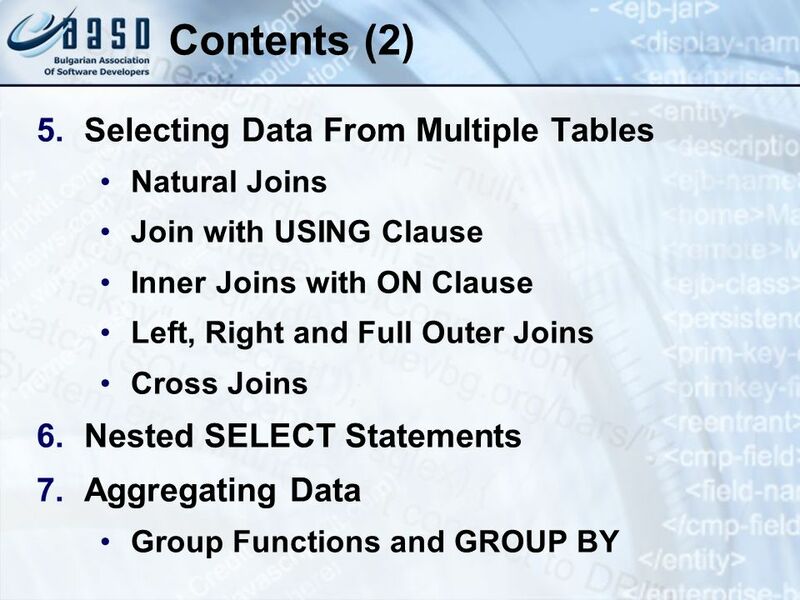 Page 97 in Course.